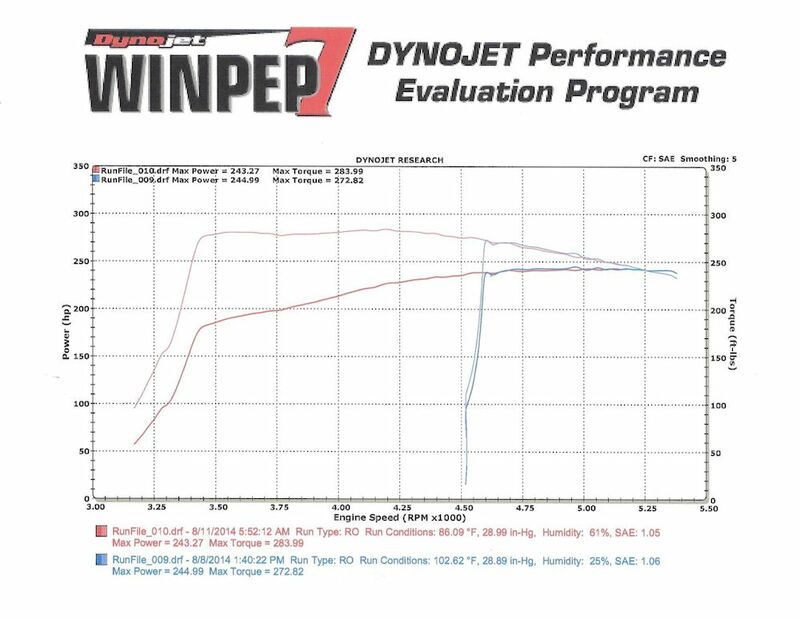 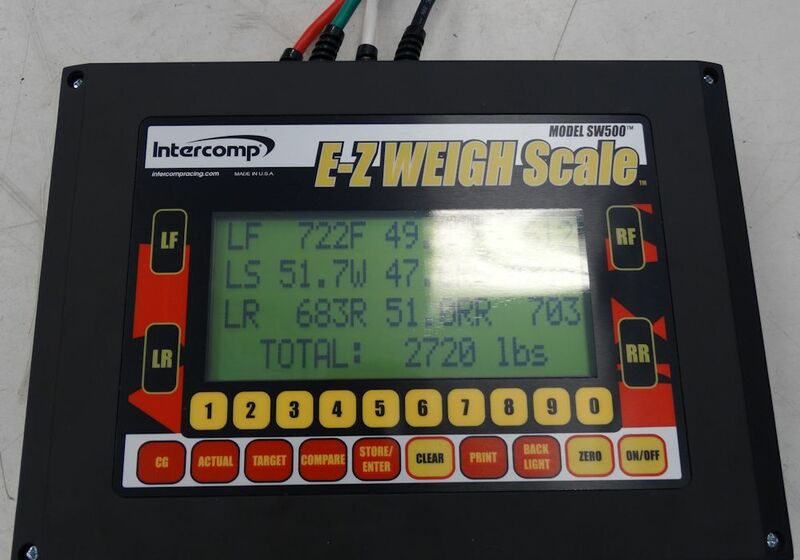 The following Dyno sheet relates to testing done in the CJ workshop on Friday 8/8/14, when the ambient temperature was well over 100 degrees F (25% humidity), and then very early this morning (8/11/14) when the temperature was 86 degrees (with stifling 61% humidity). The HP and torque numbers shown are at the rear wheels, equating to approximately 307 HP and 355 ft/lbs of torque at the flywheel. 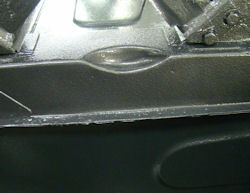 If we had tested the car on a cooler, less humid day, the numbers would no doubt have been higher. 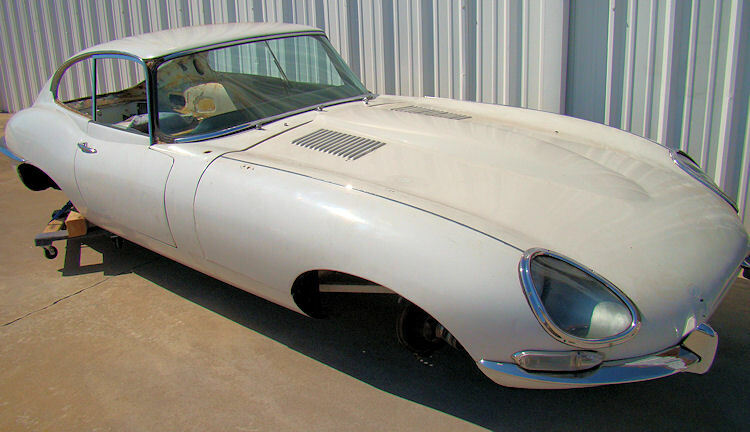 That said, whatever the conditions, these are impressive numbers for a Stage One E Type. 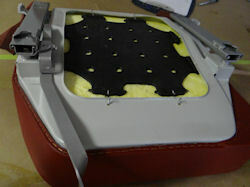 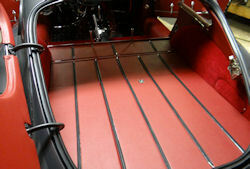 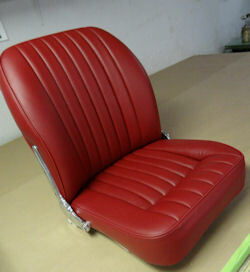 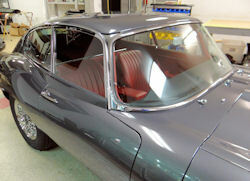 Another completed Team CJ restoration homeward bound.. 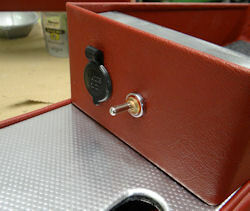 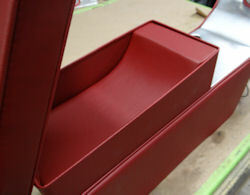 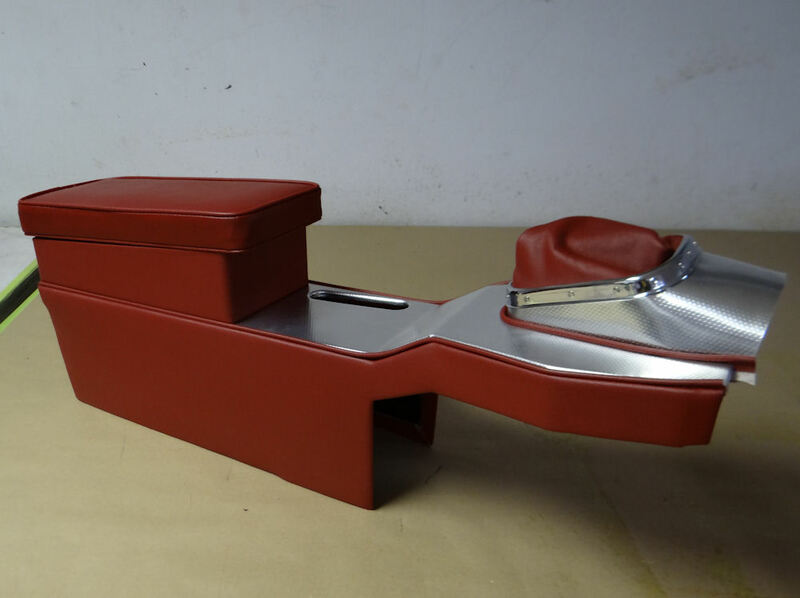 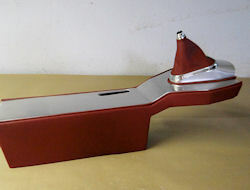 Restoring and trimming center console cubby box. 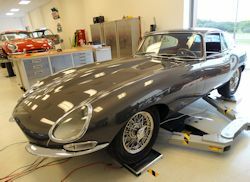 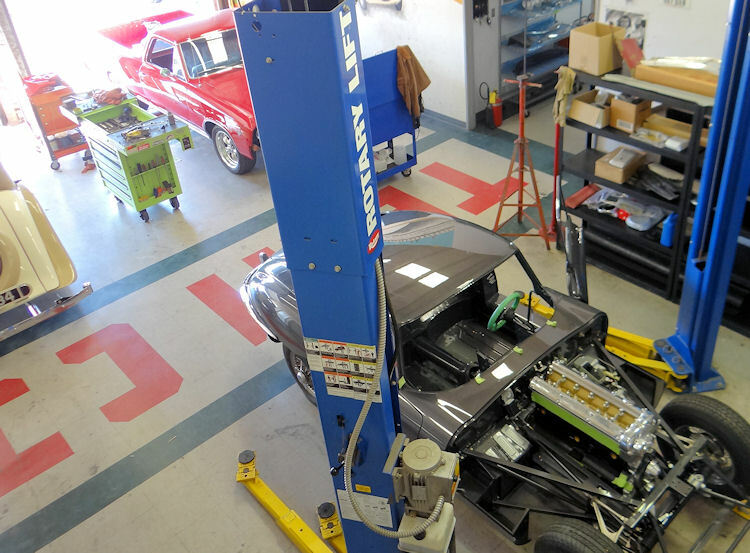 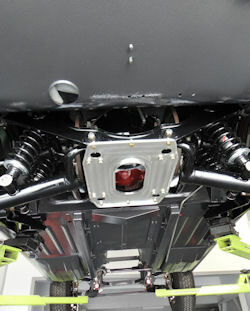 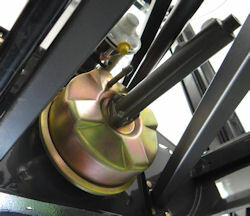 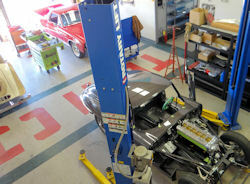 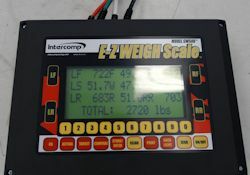 Click on the thumbnail photo below to see a video clip of your car being test run on the Dyno earlier today. Initial firing went very well - no problems! 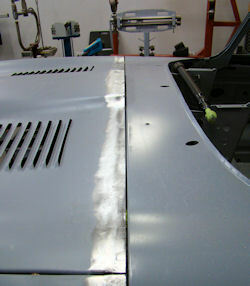 I am pleased to report that your car is now rolling once again! 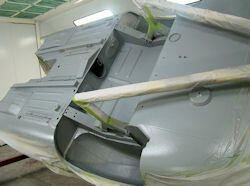 Yesterday afternoon we painted the underside of your car. 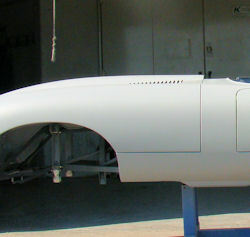 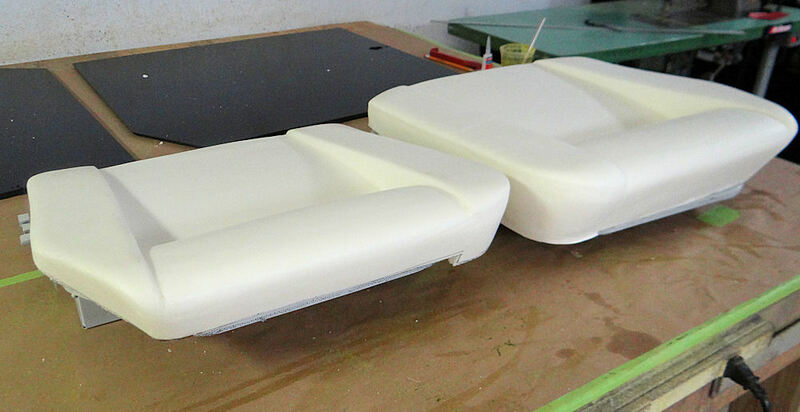 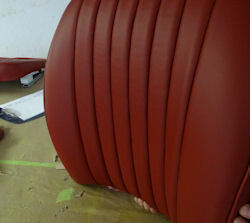 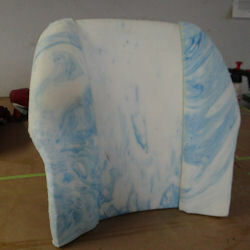 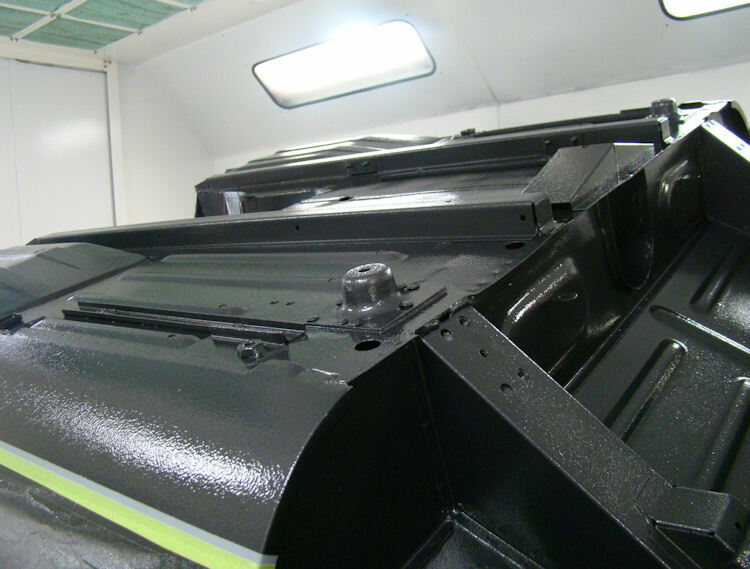 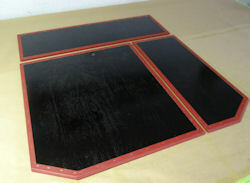 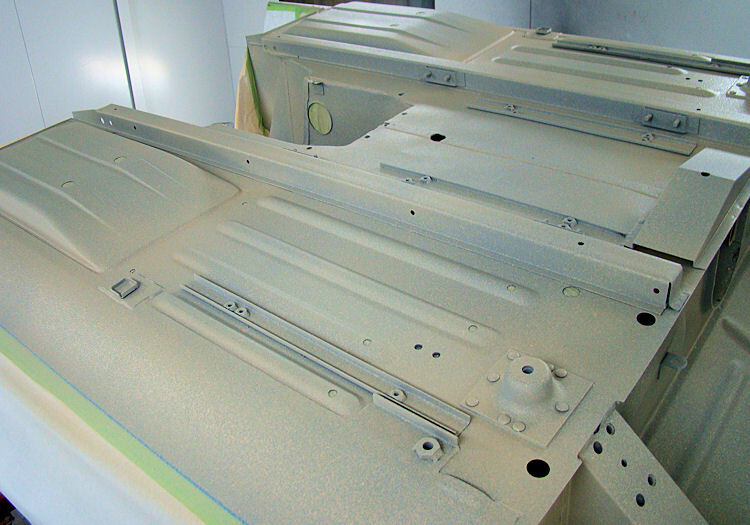 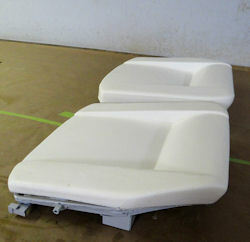 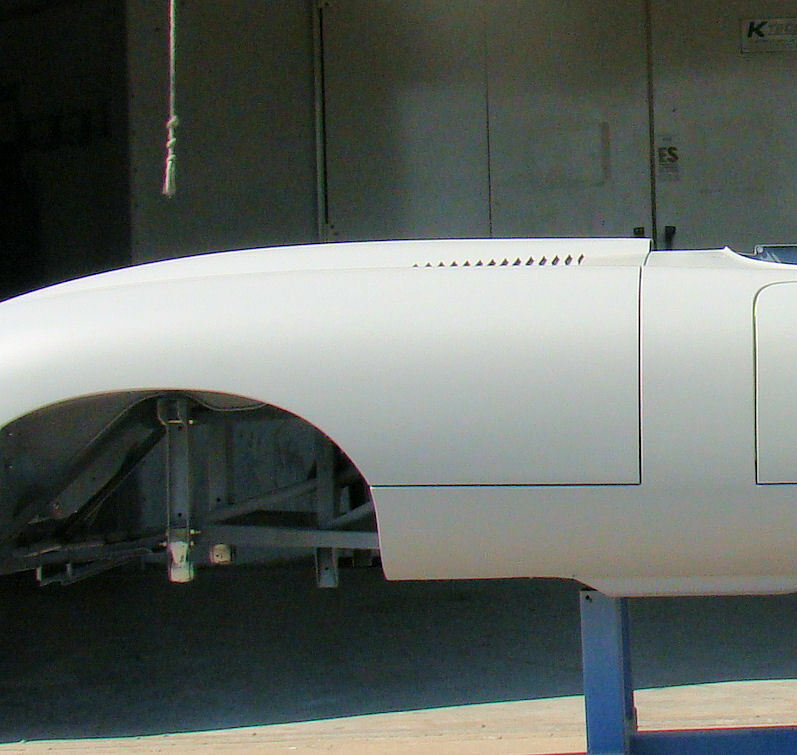 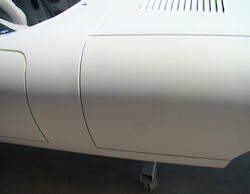 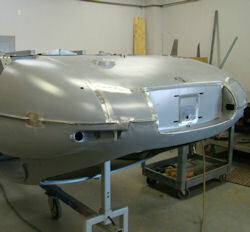 Later today we will start painting the outer panels. 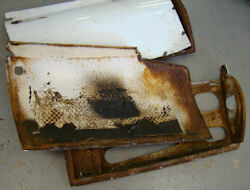 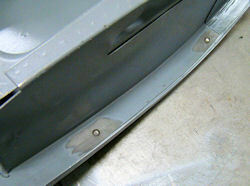 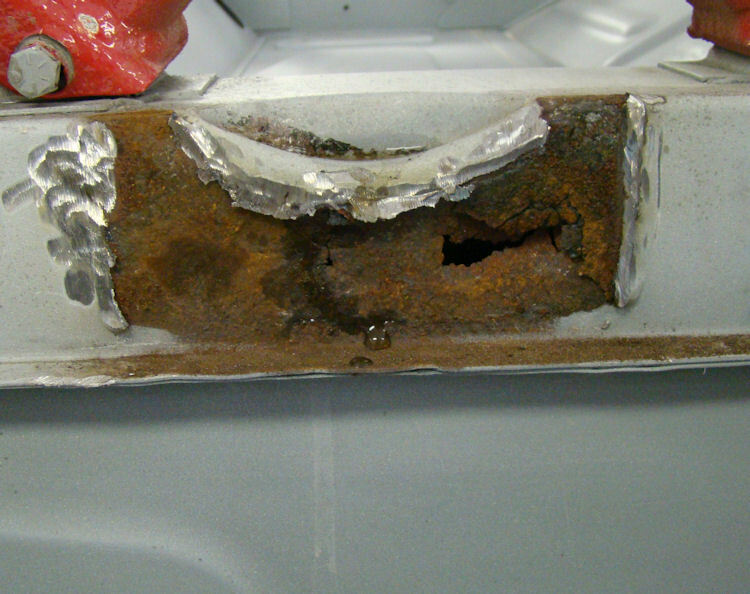 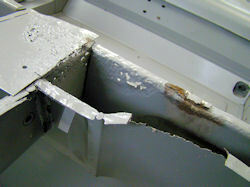 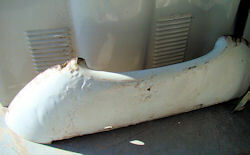 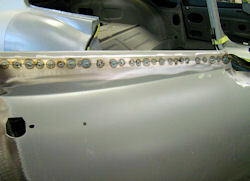 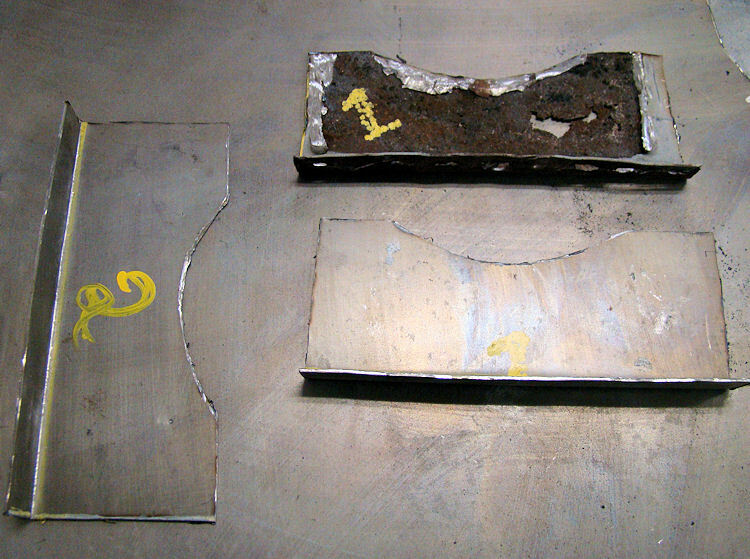 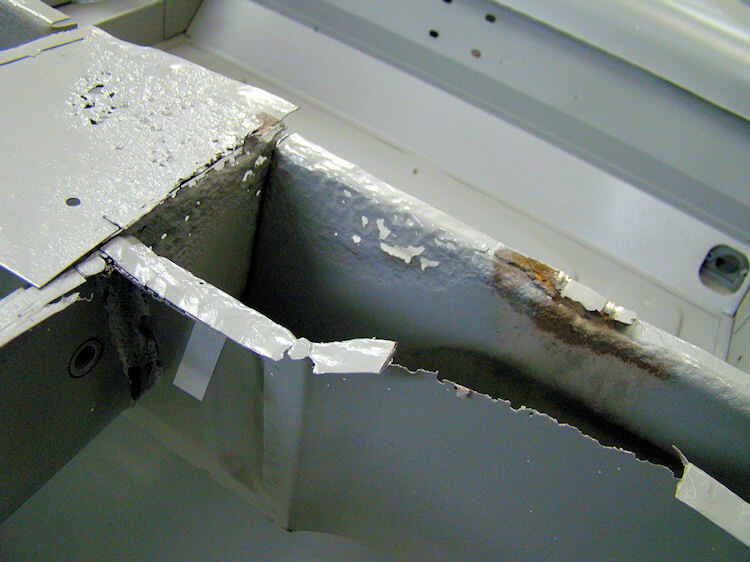 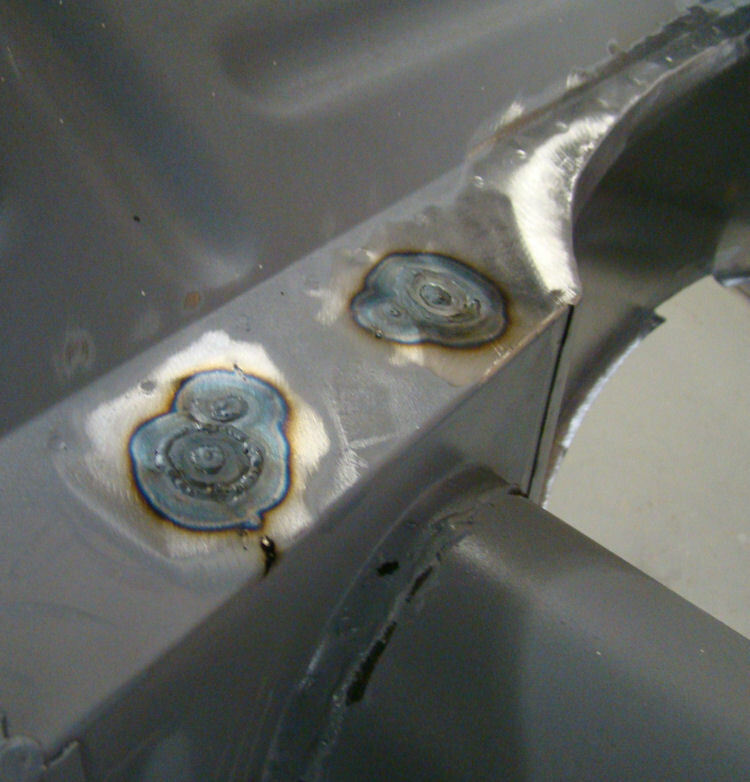 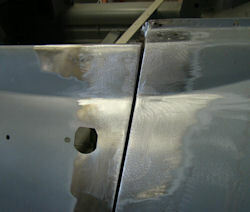 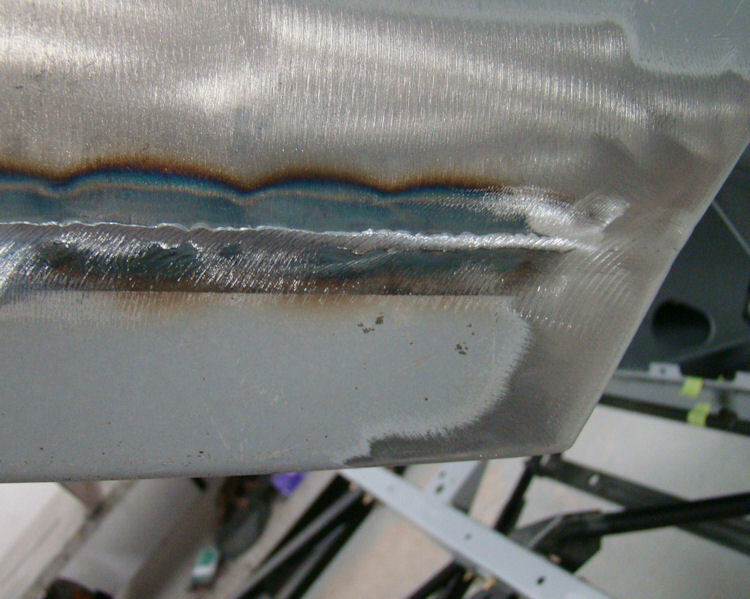 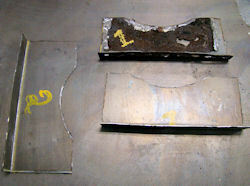 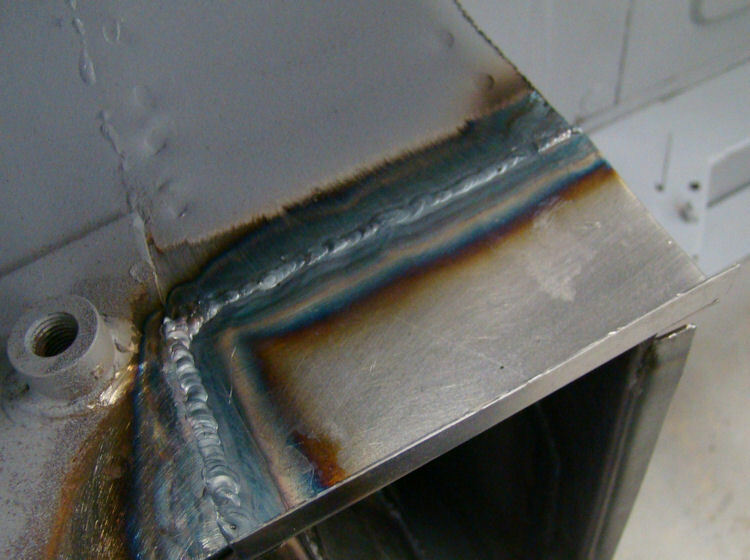 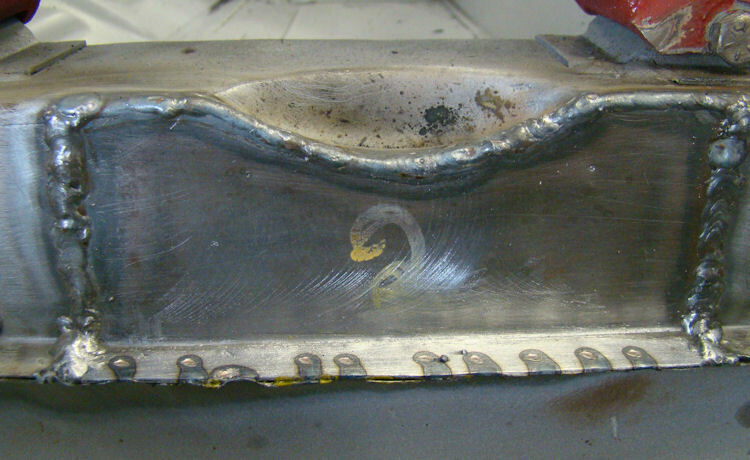 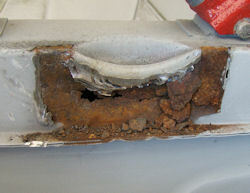 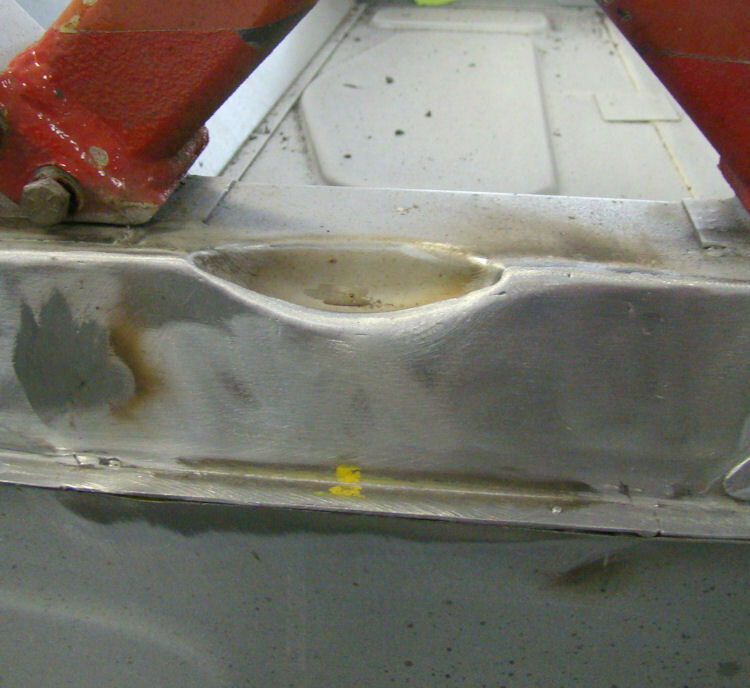 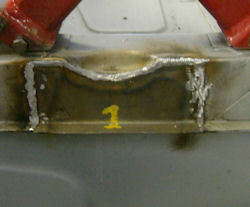 When cutting out the rear wheel arch bump stop brackets, we found corroded sheet metal lurking behind the brackets. Oscar cut out the offending sheet metal, fabricated replacement panels and welded them in place. 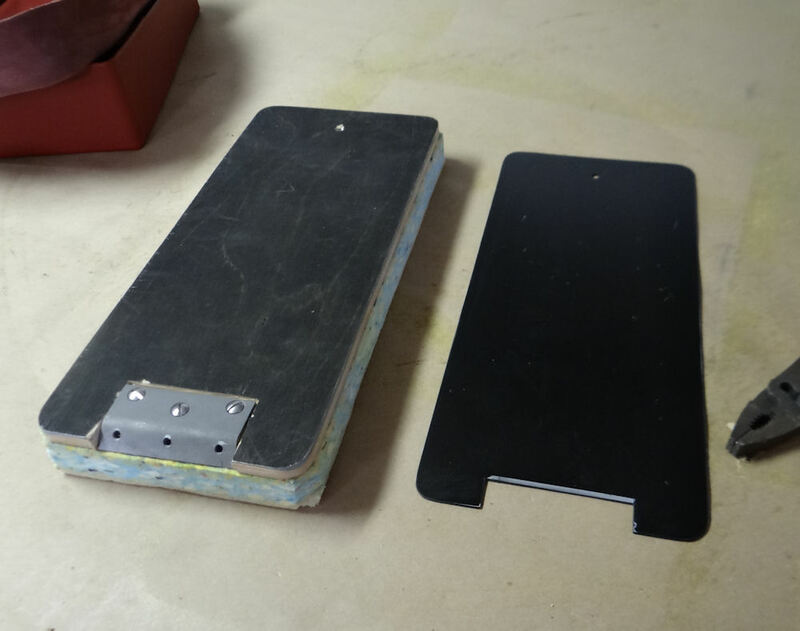 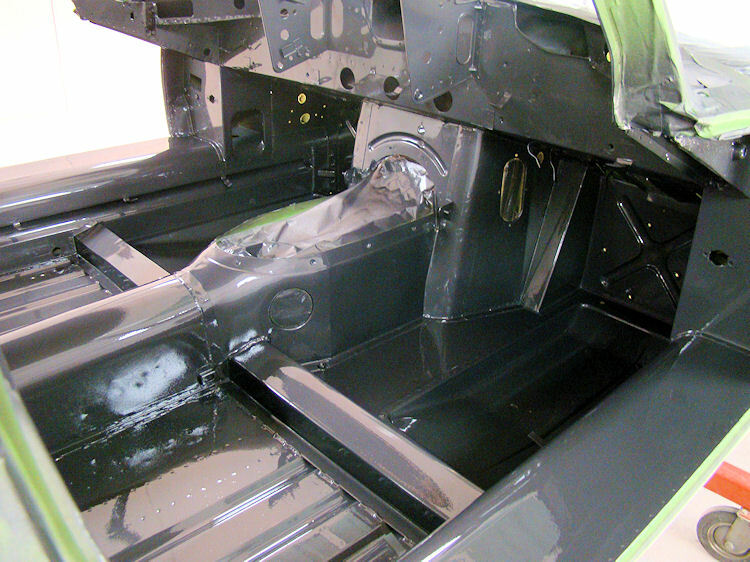 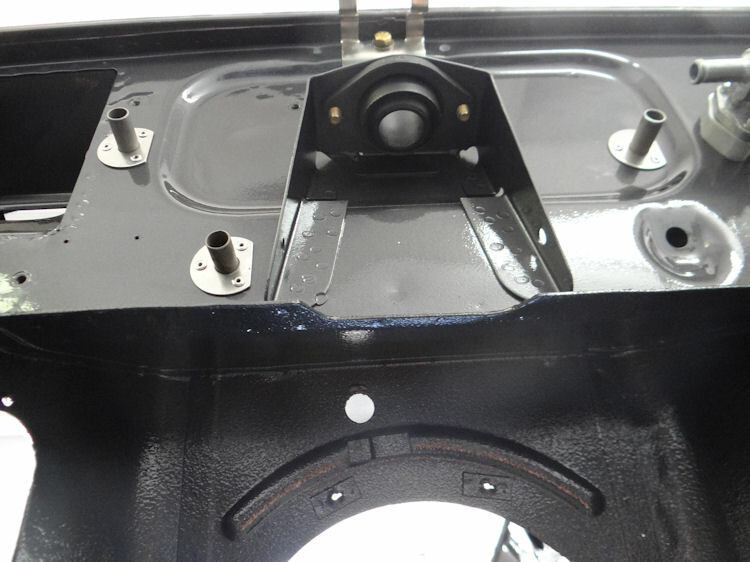 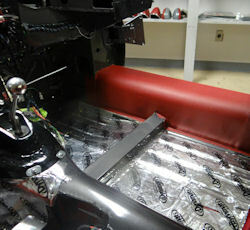 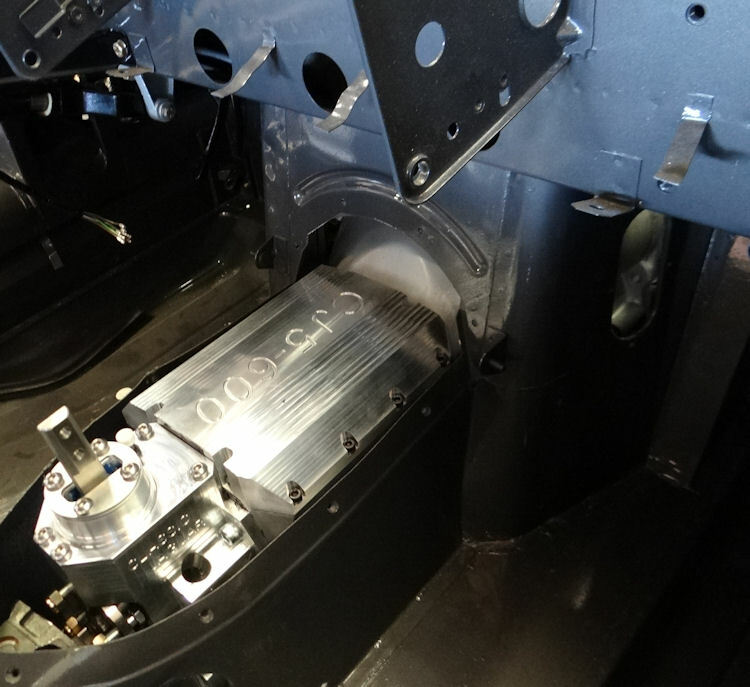 We also took the opportunity to clean inside of the rear "chassis legs" and applied primer and Wurth Body Wax inside the box sections, before sealing them up with the repair panels. 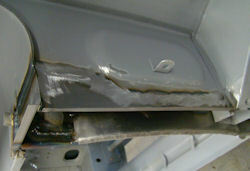 Fortunately, as you can see in the third photo in the sequence below, the corrosion was limited to the area immediately behind the bump stop brackets, which of course are a bit of a mud trap, up inside the rear wheel arches. 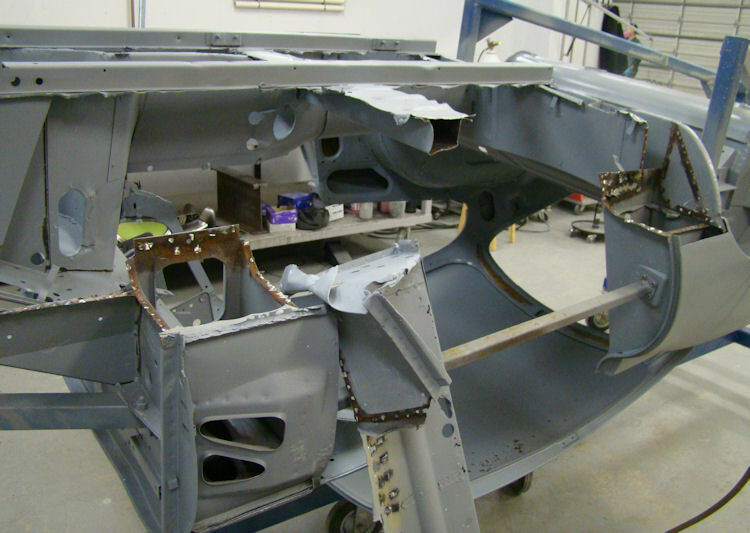 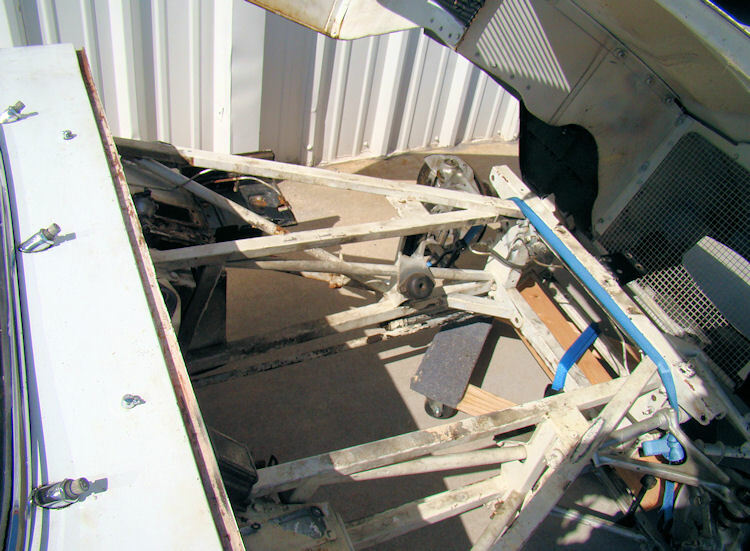 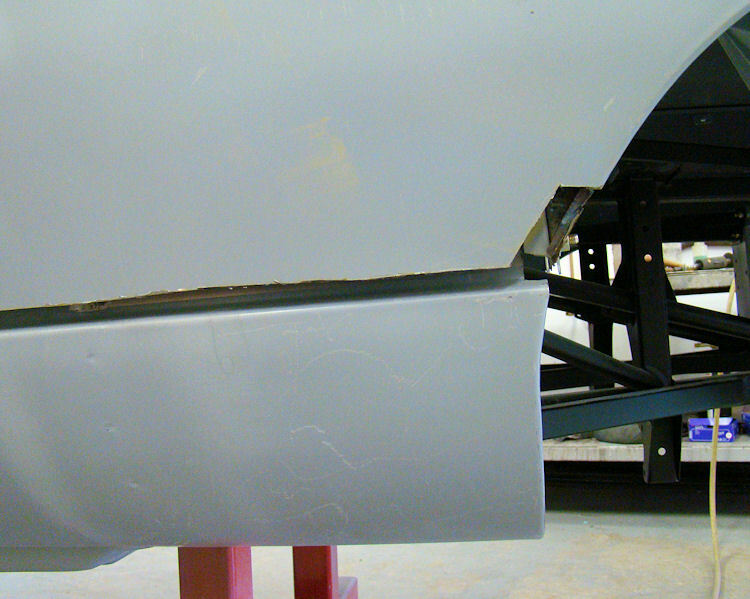 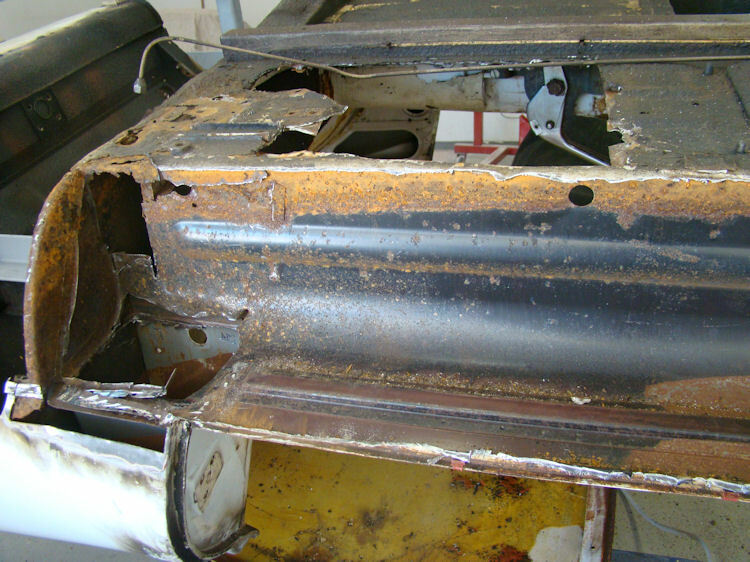 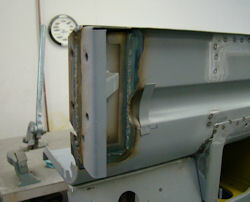 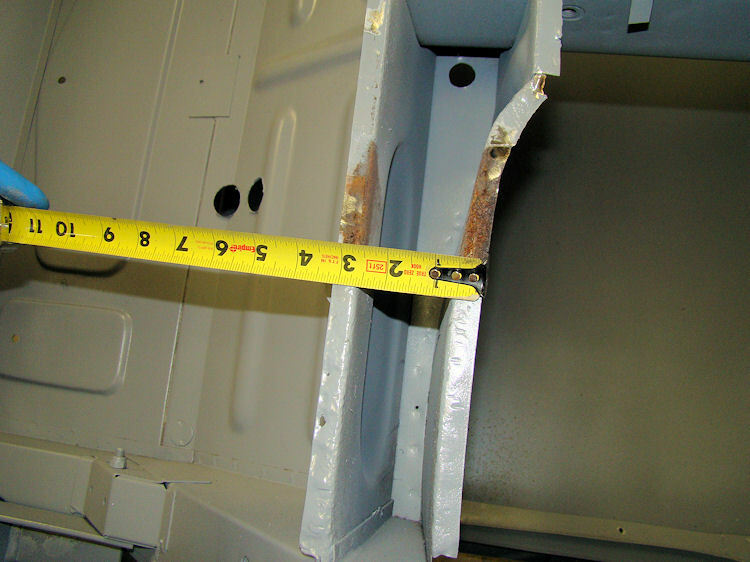 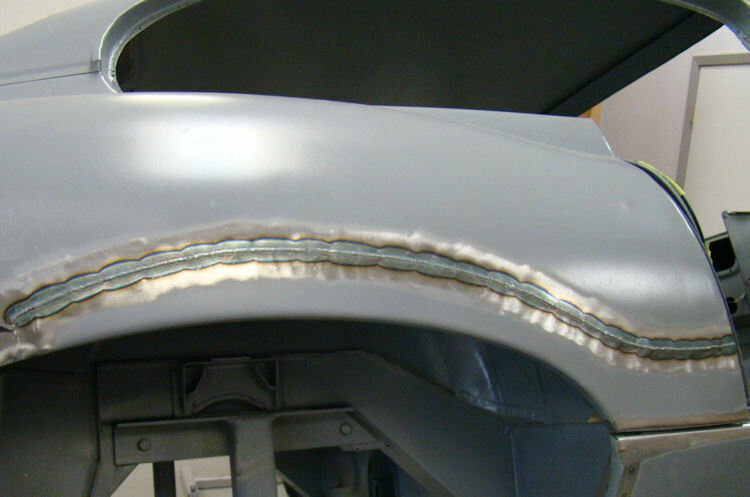 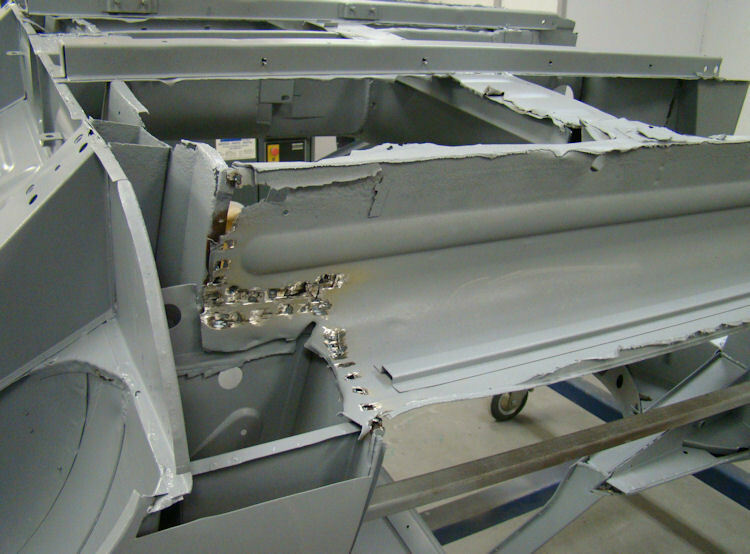 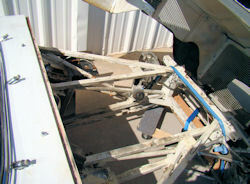 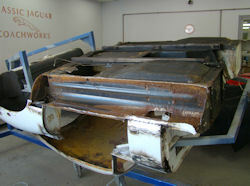 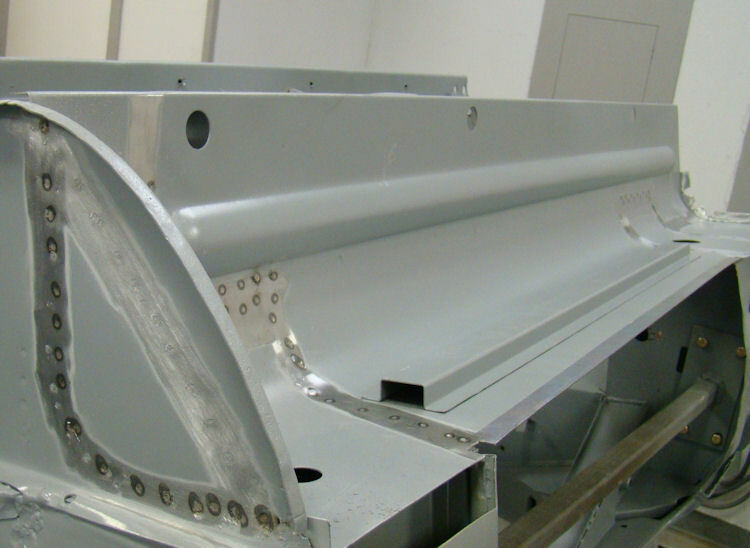 The rest of the chassis legs were completely rust free. 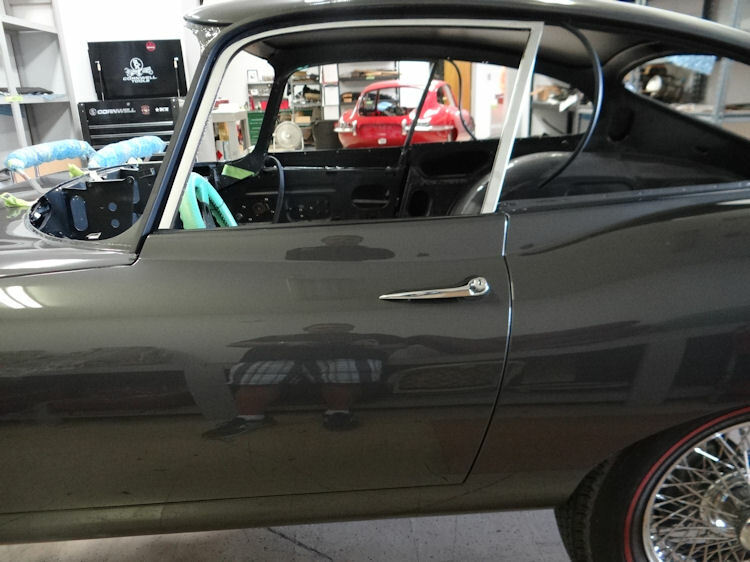 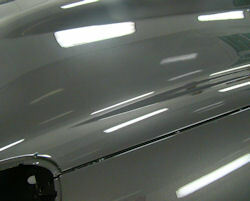 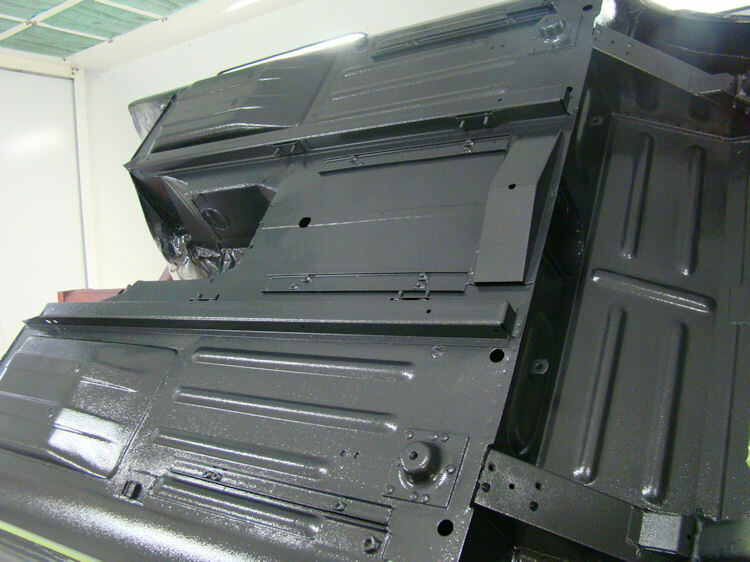 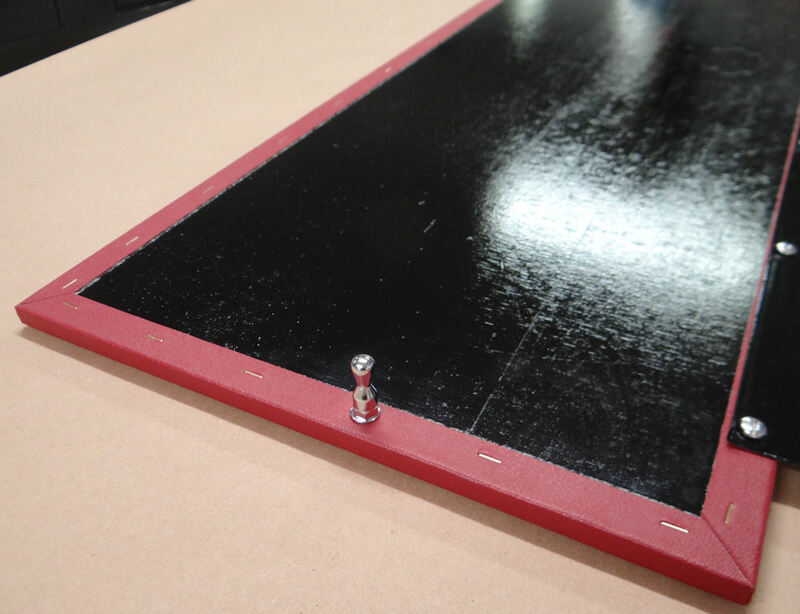 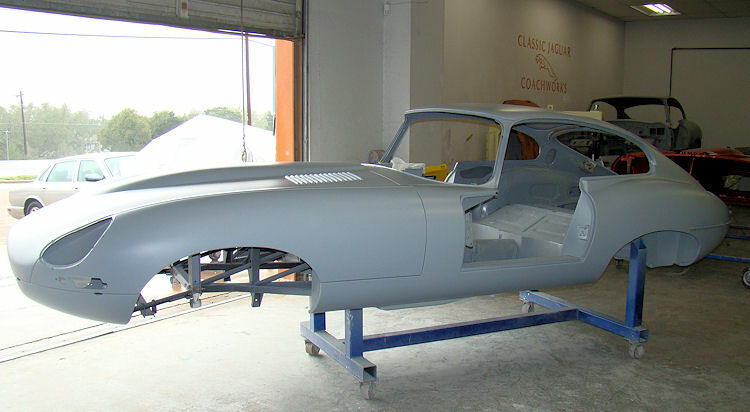 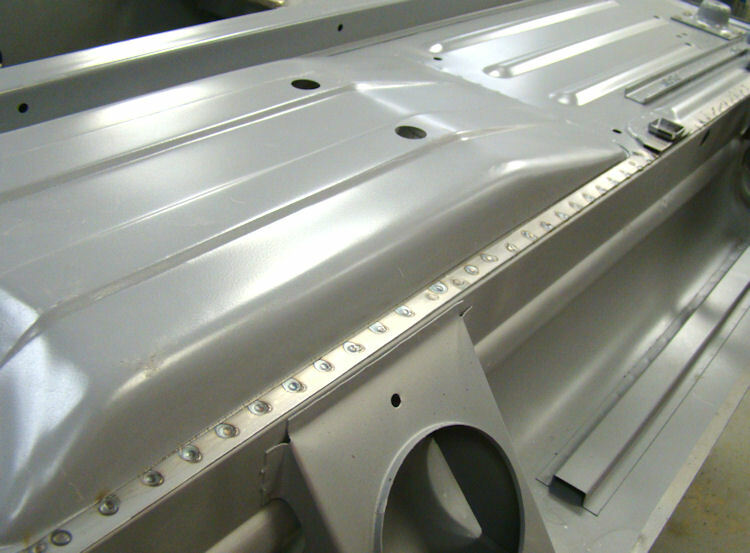 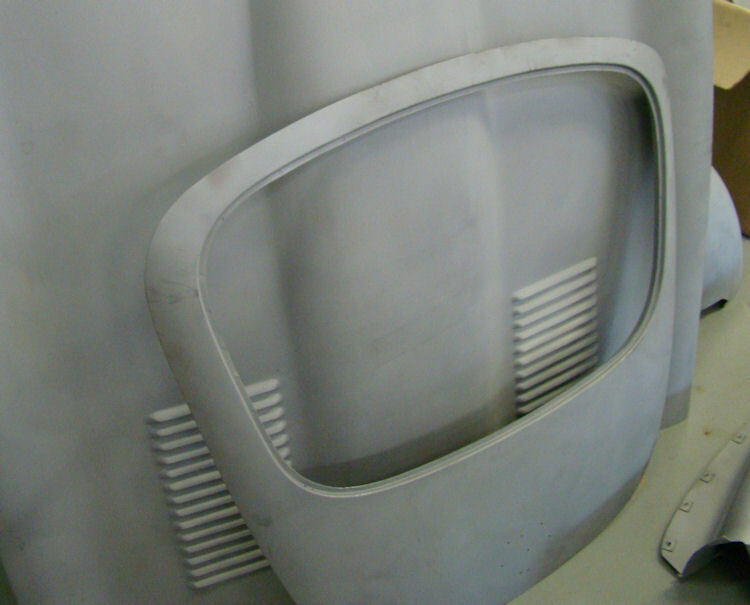 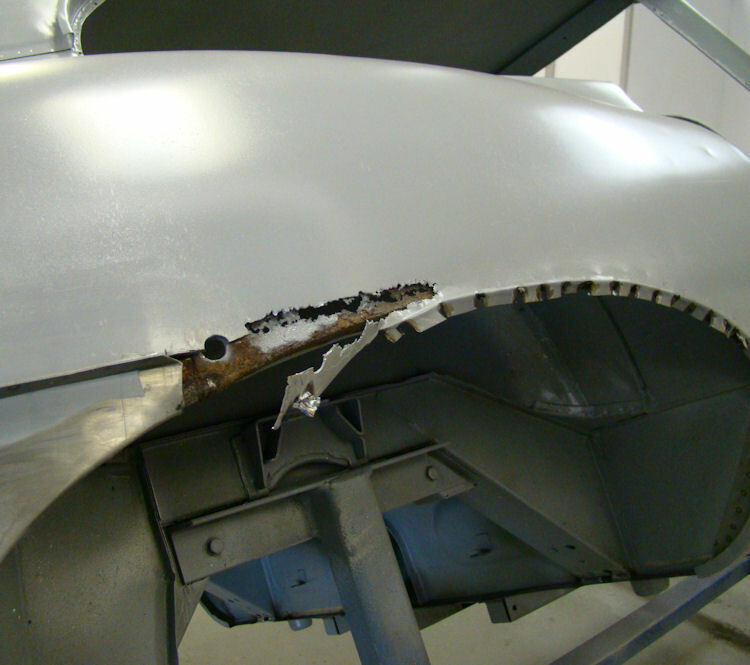 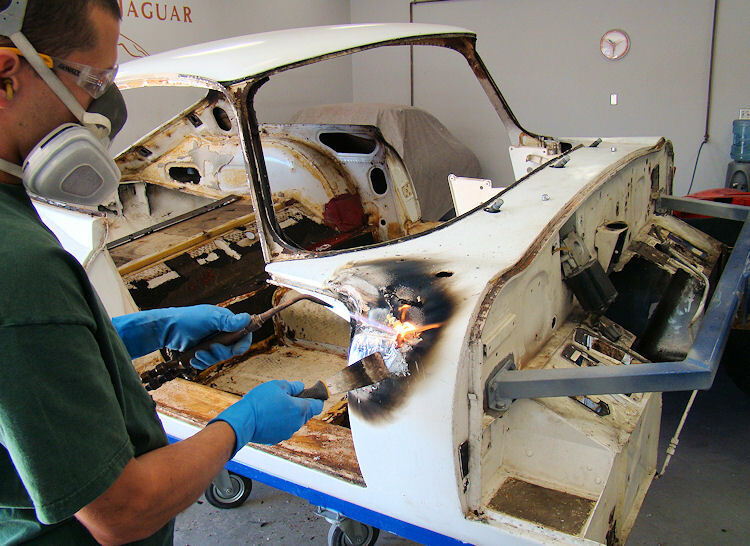 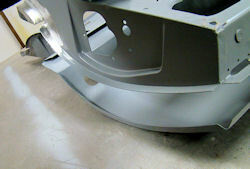 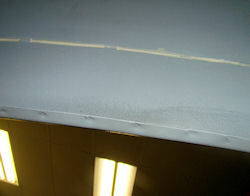 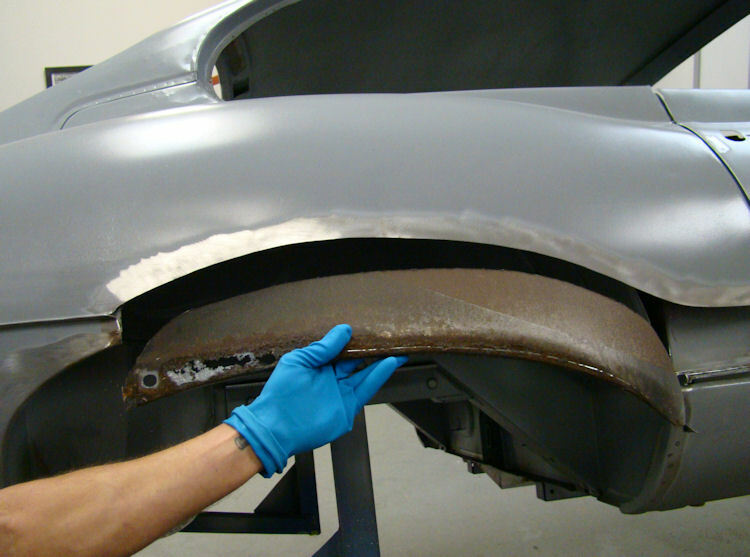 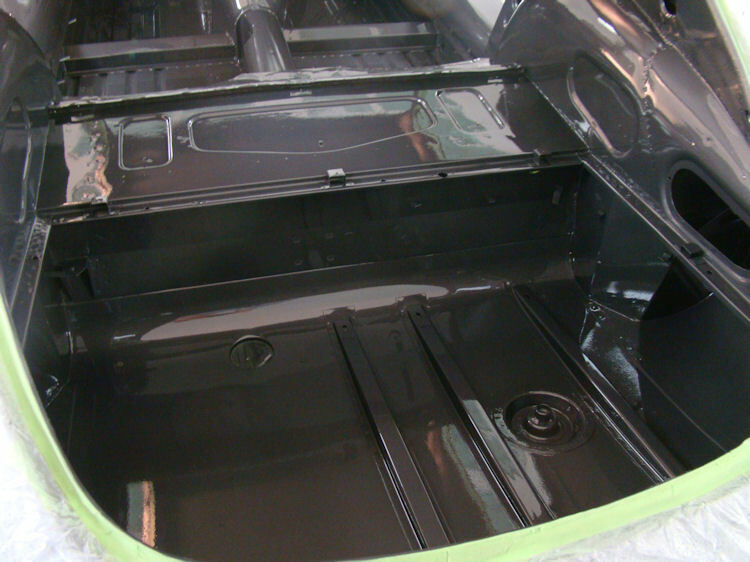 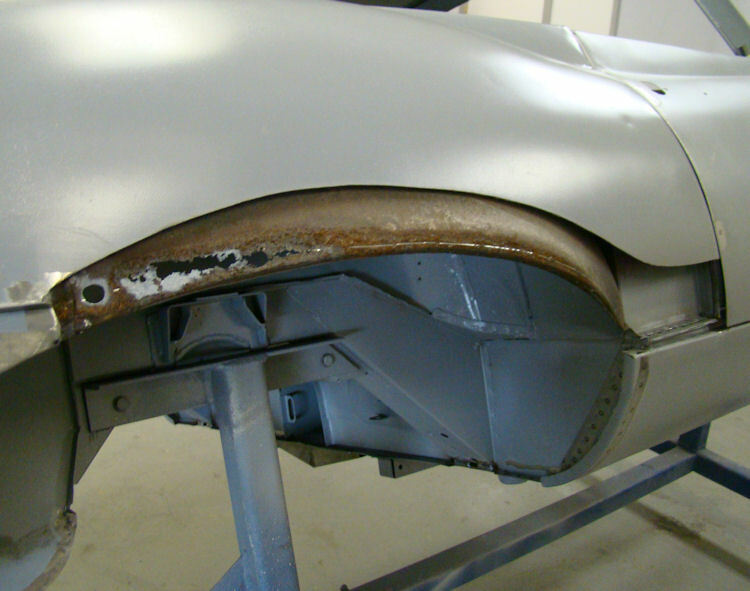 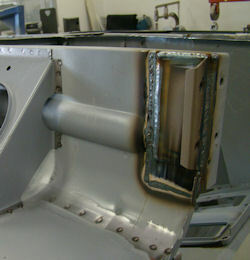 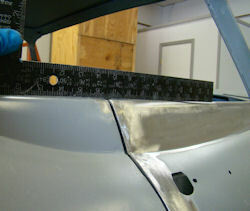 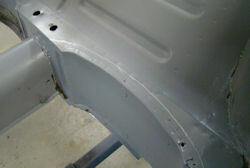 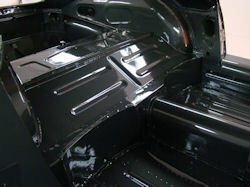 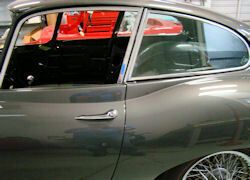 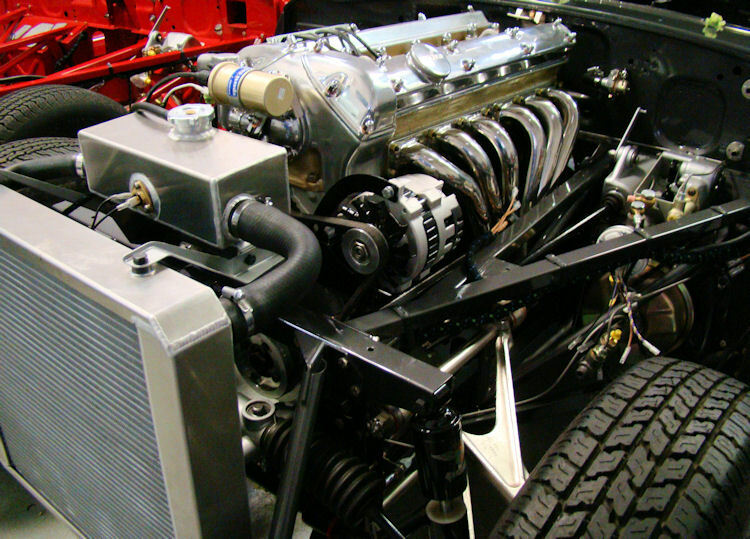 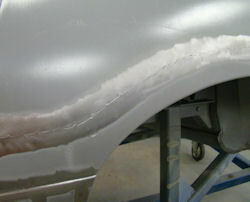 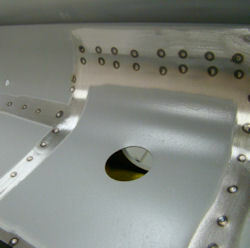 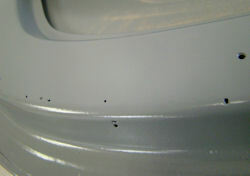 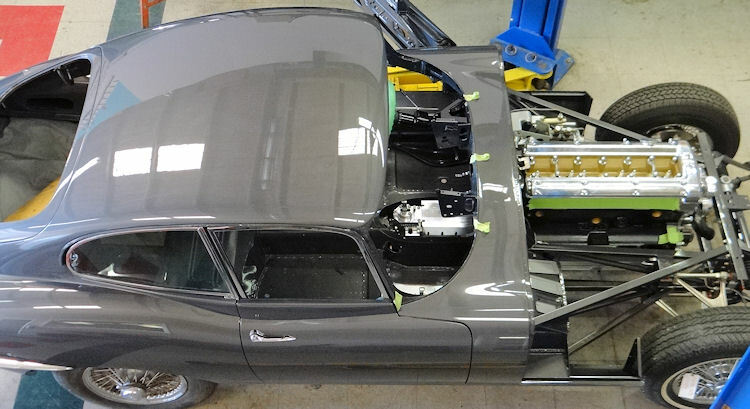 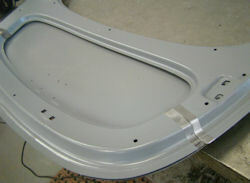 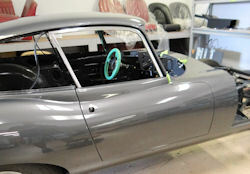 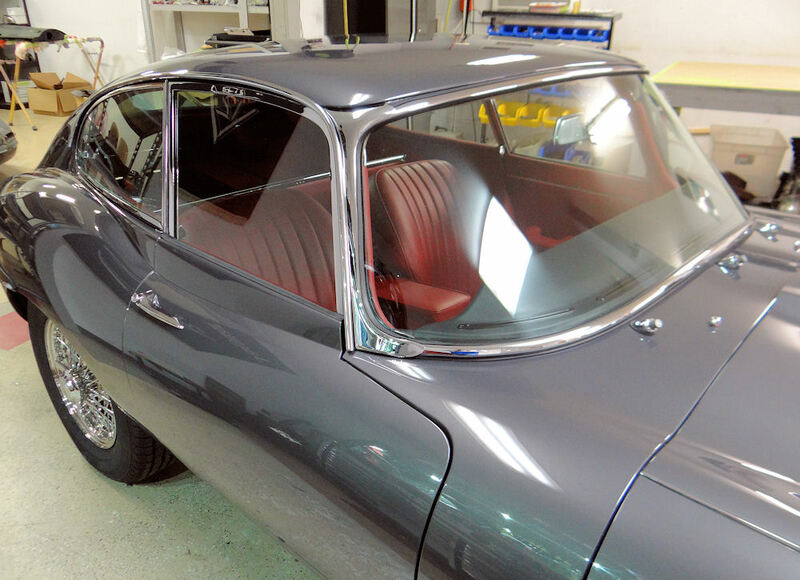 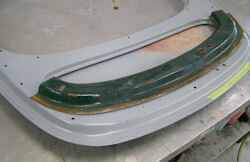 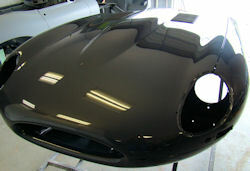 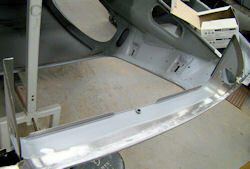 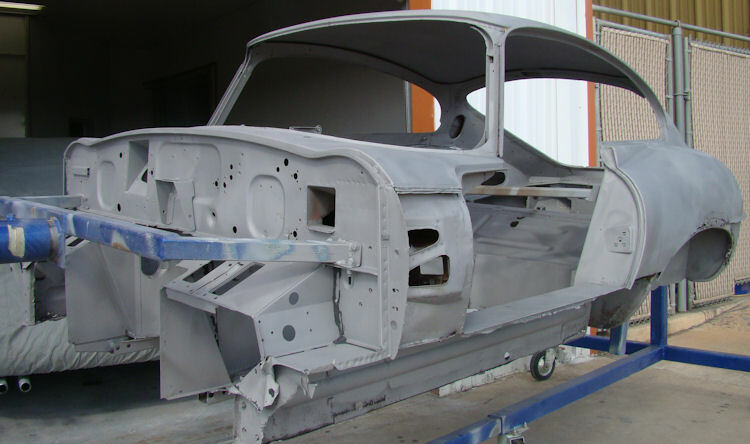 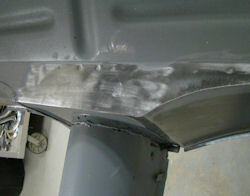 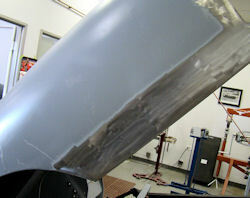 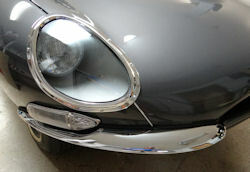 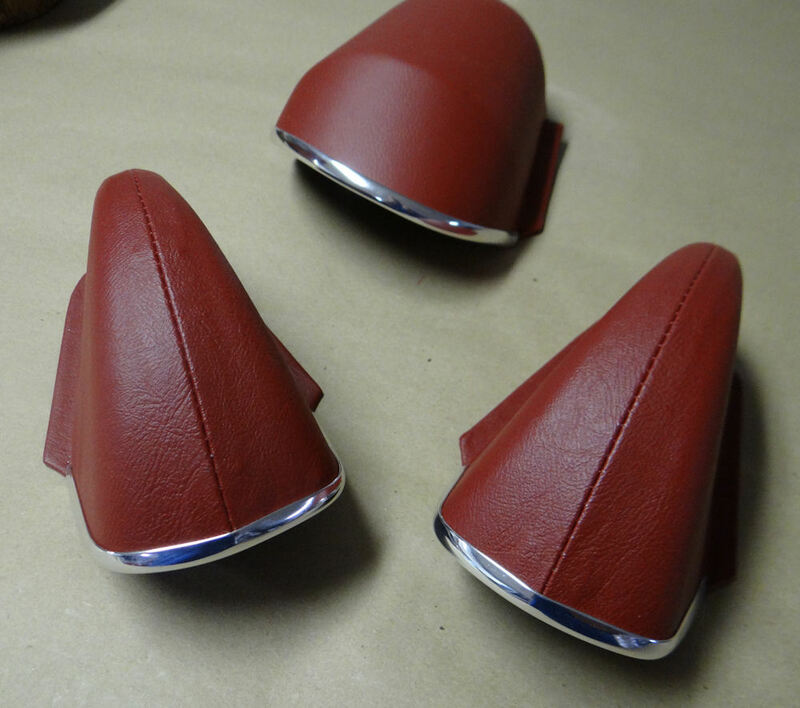 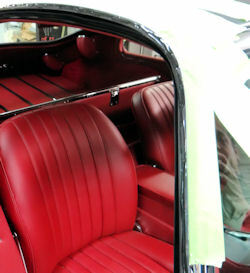 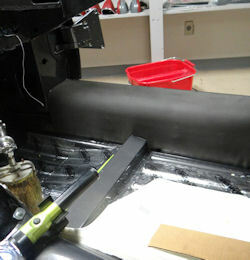 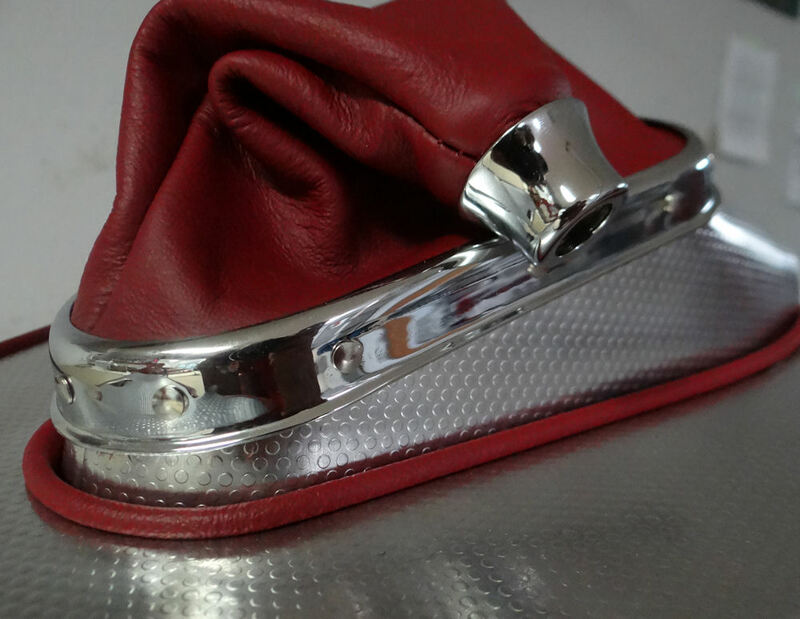 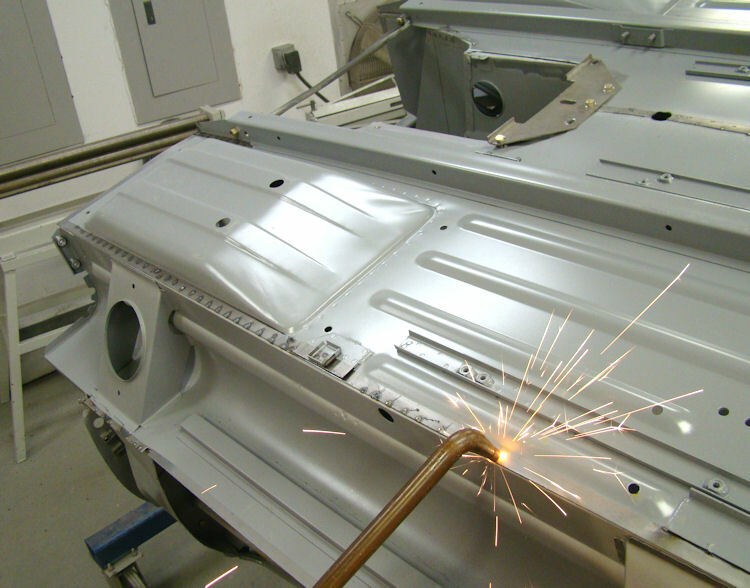 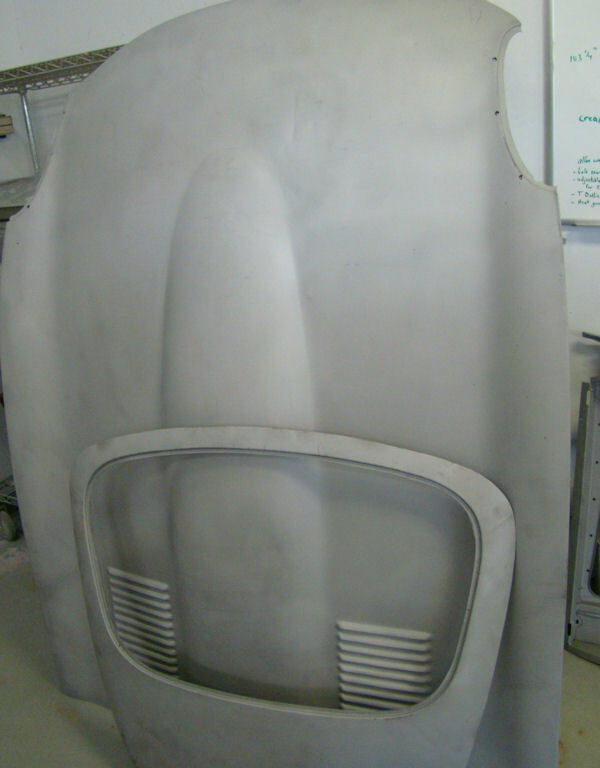 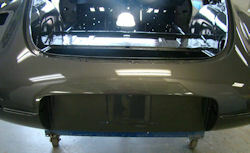 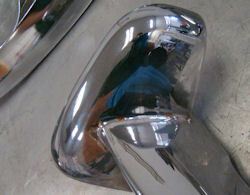 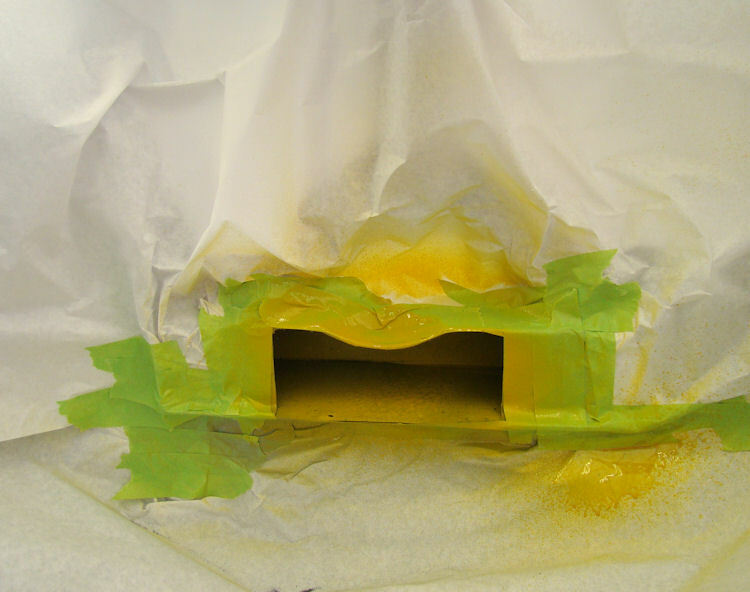 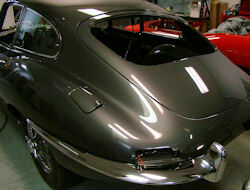 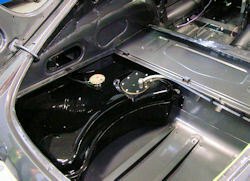 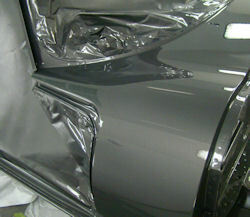 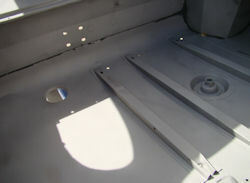 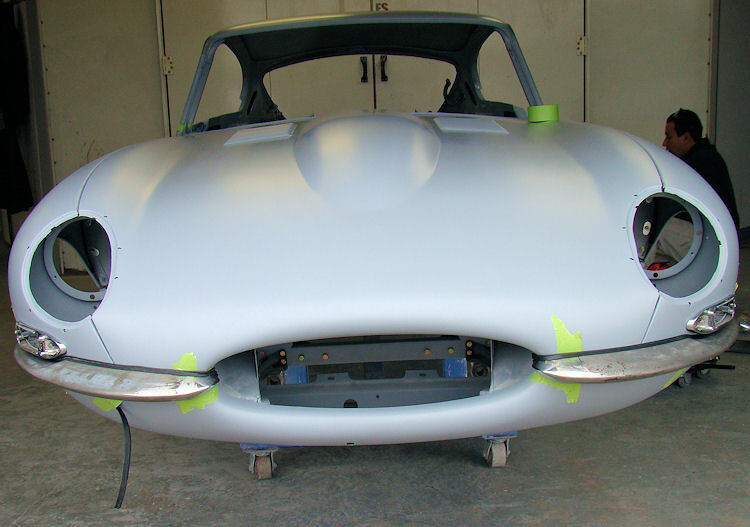 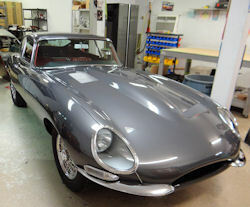 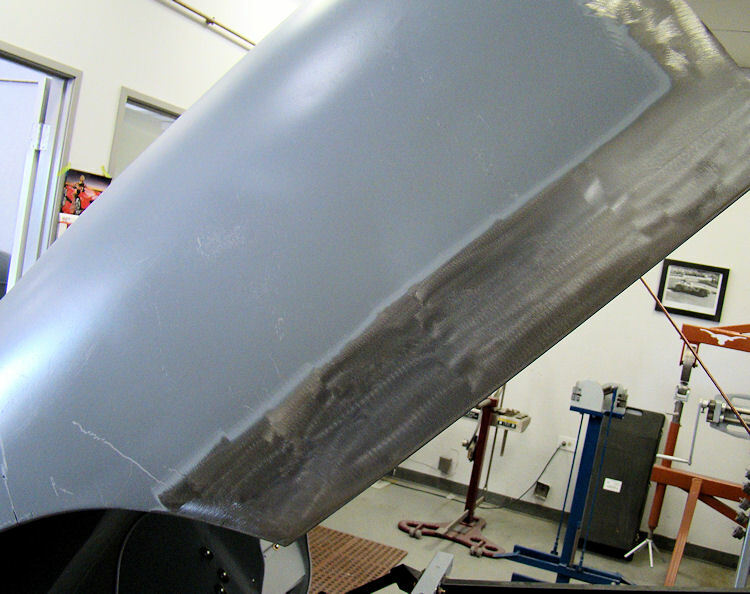 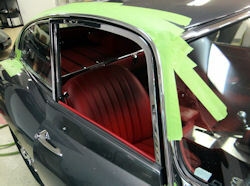 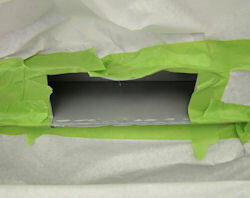 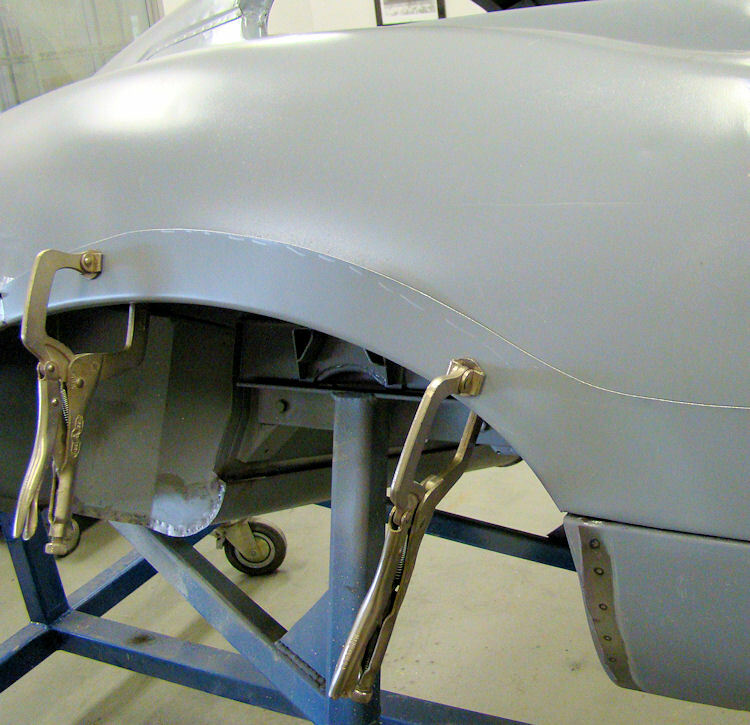 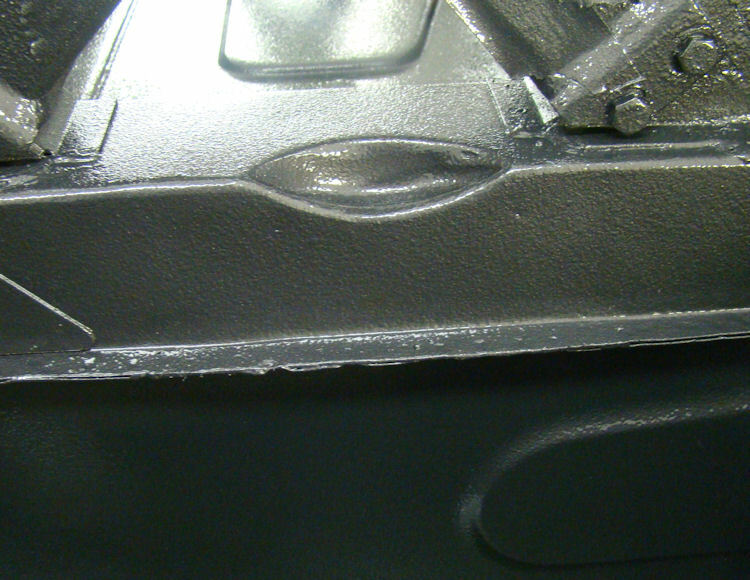 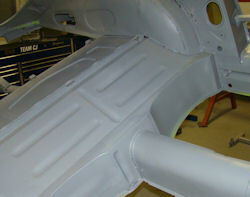 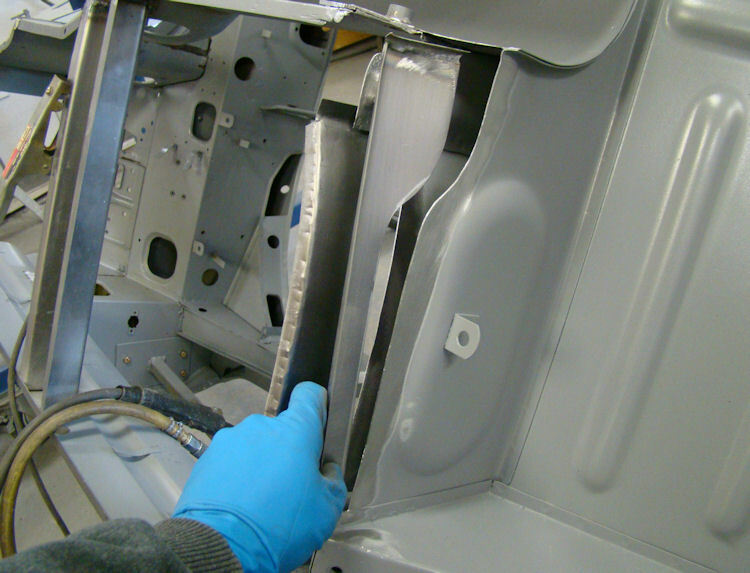 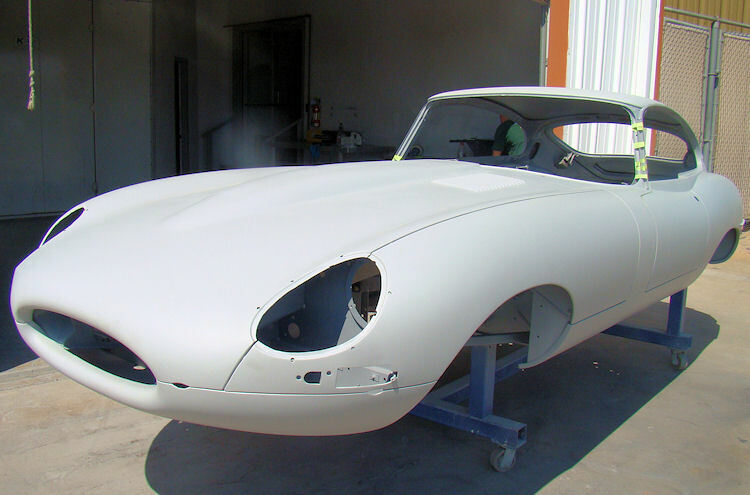 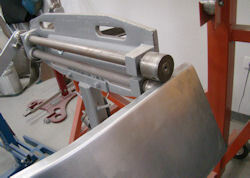 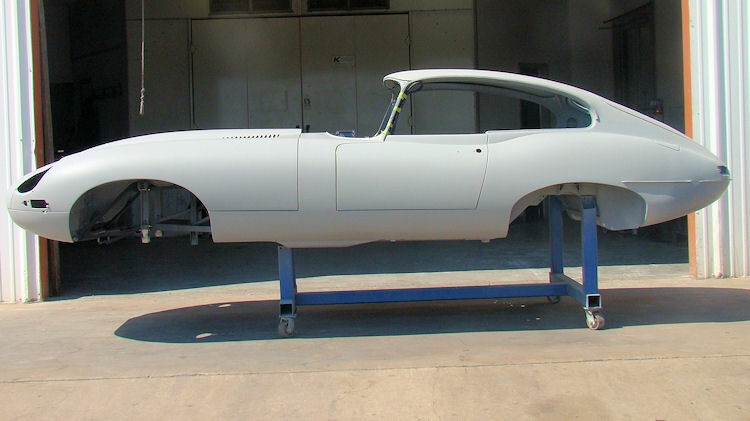 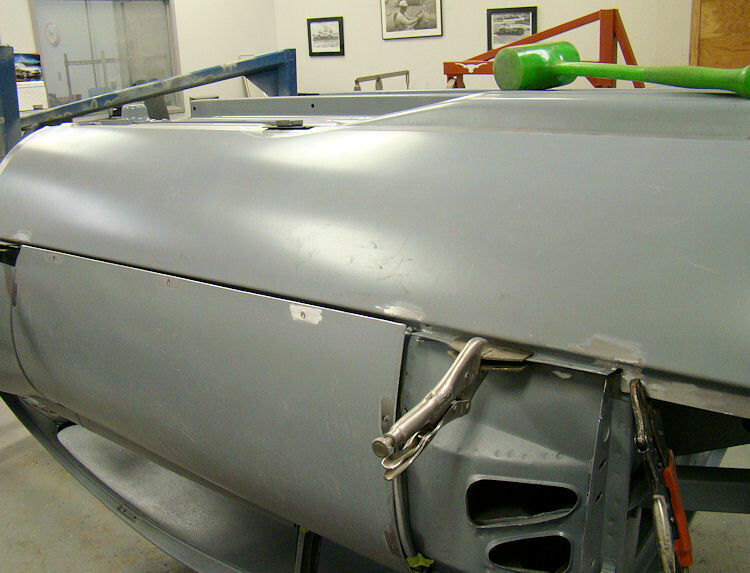 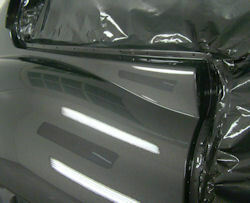 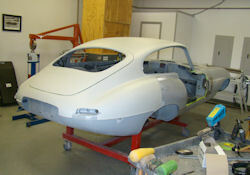 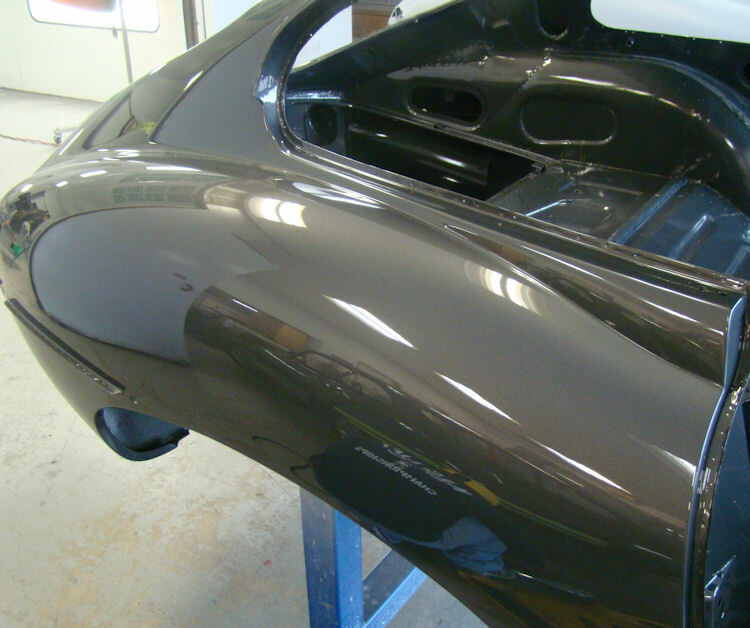 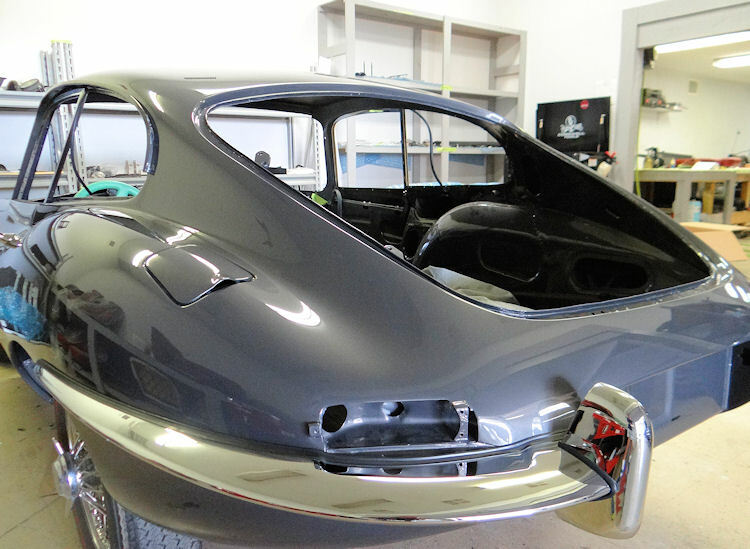 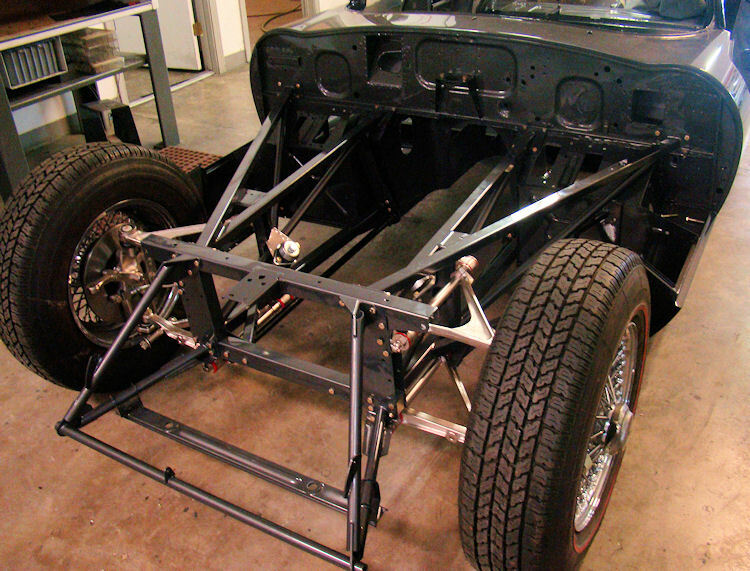 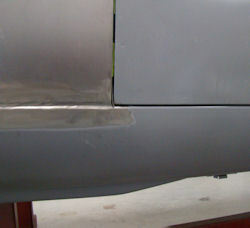 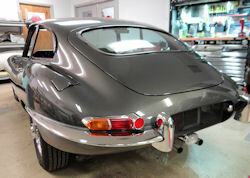 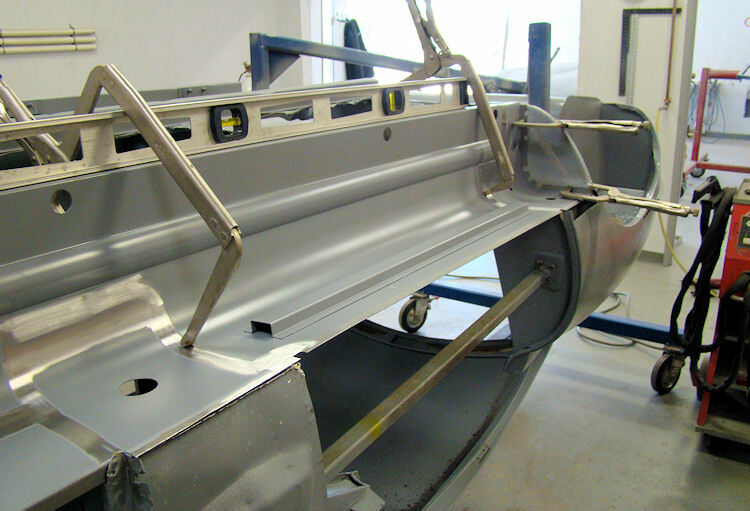 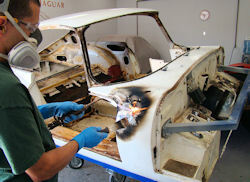 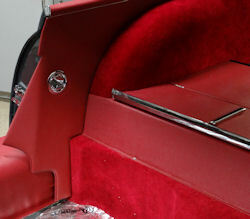 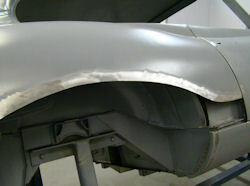 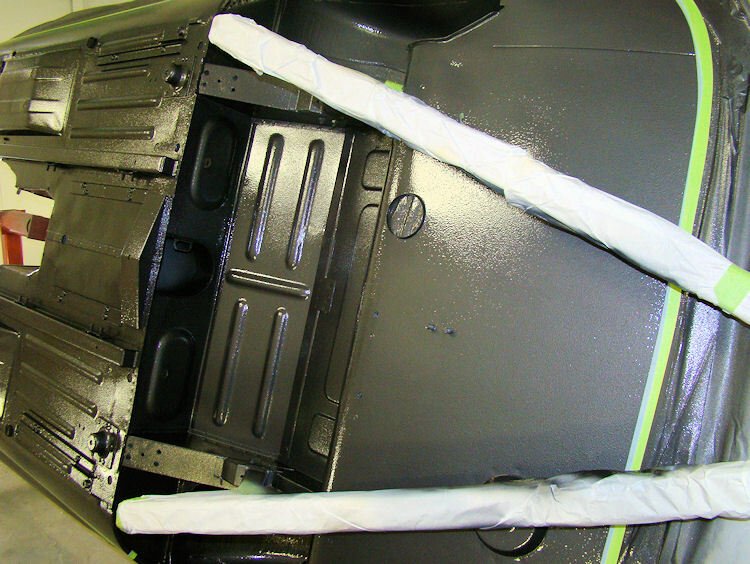 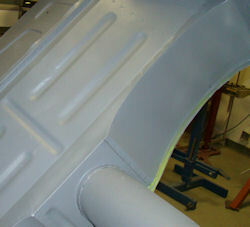 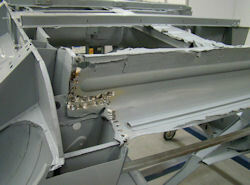 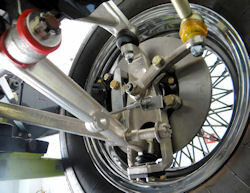 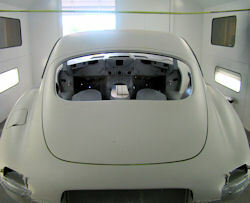 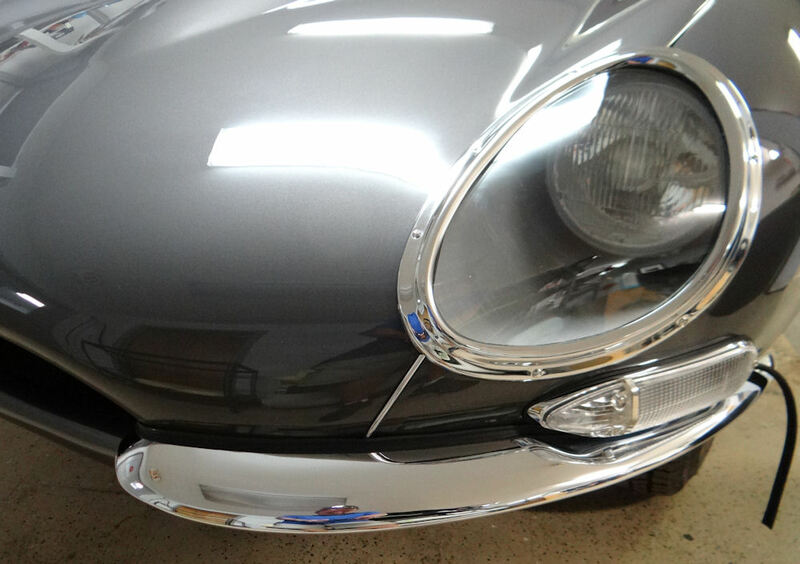 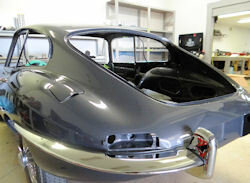 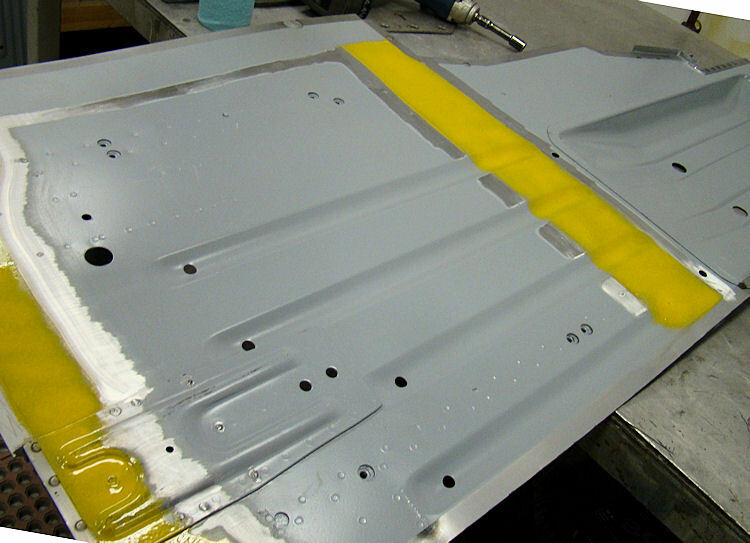 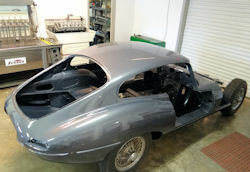 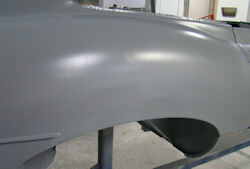 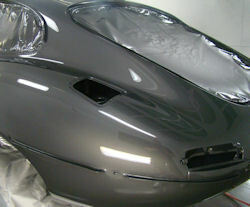 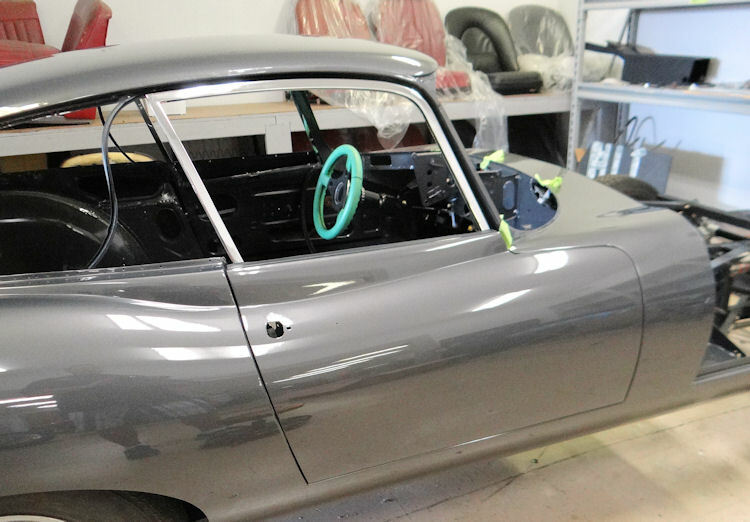 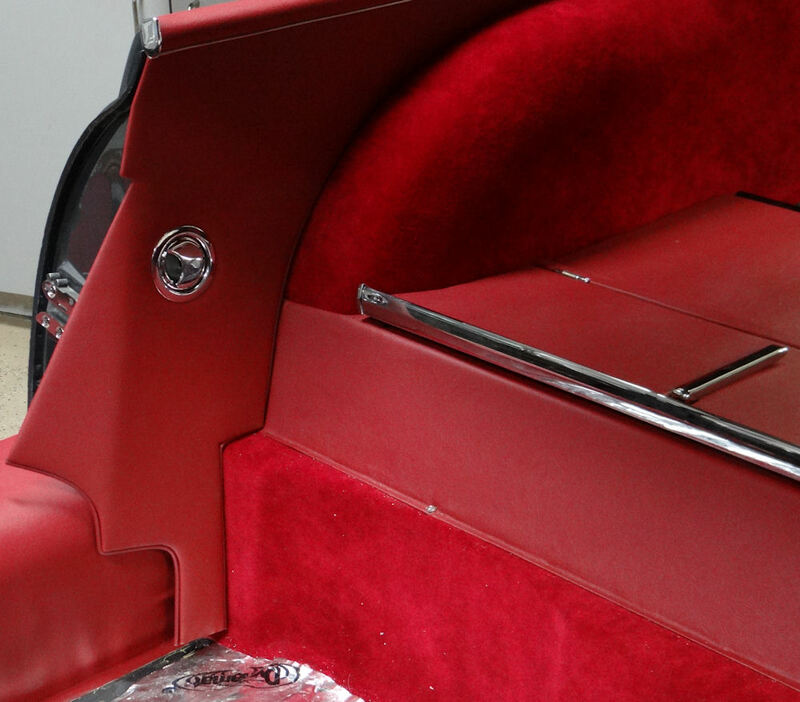 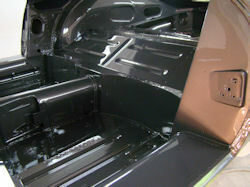 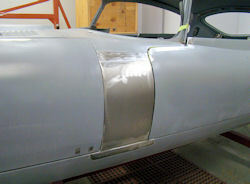 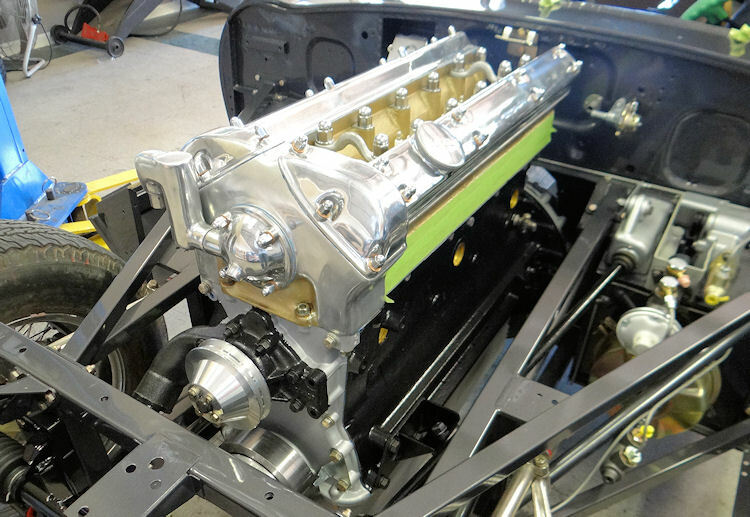 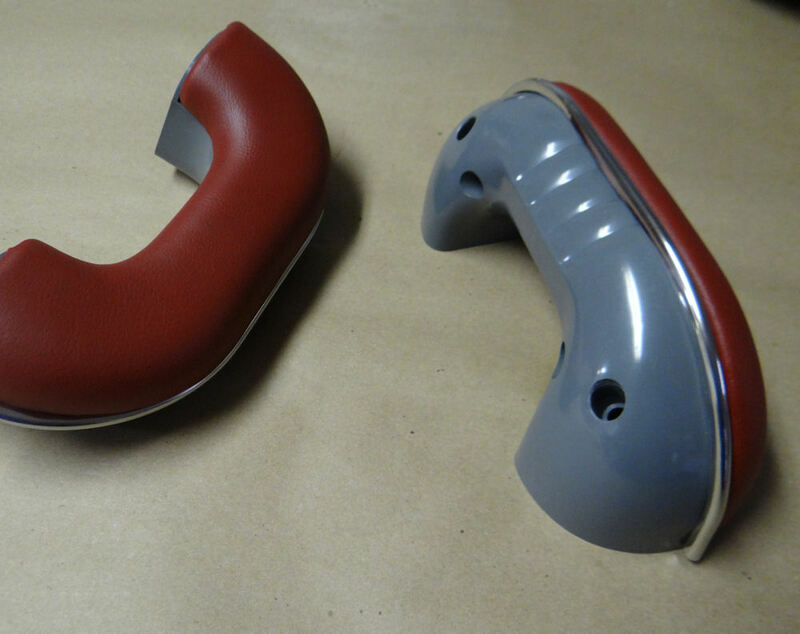 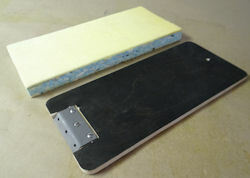 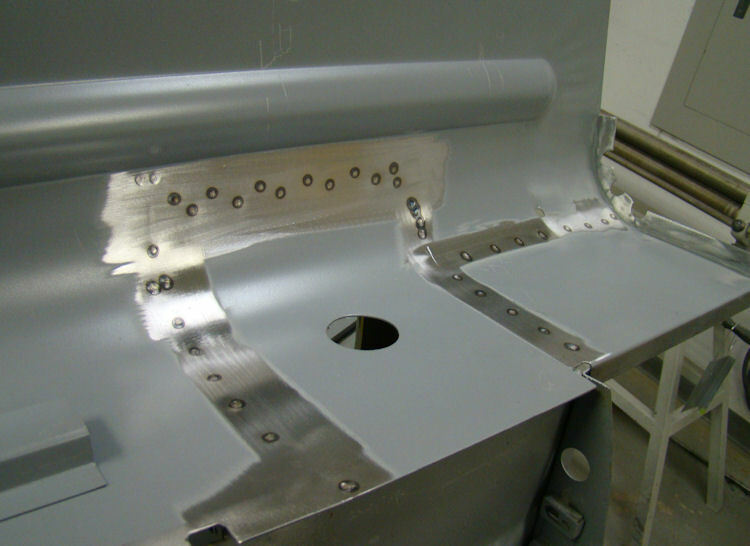 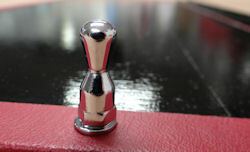 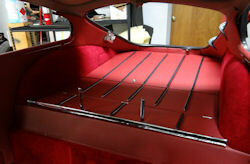 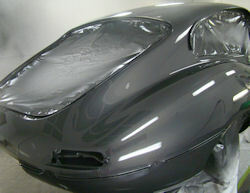 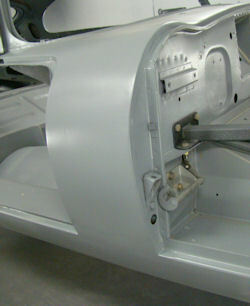 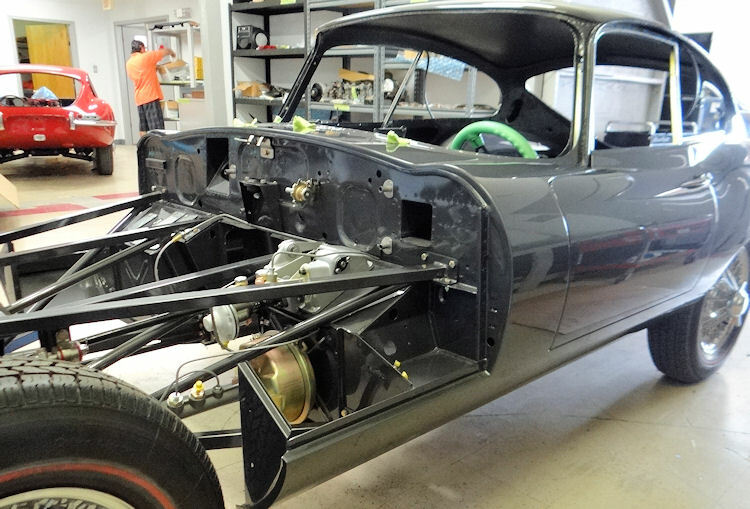 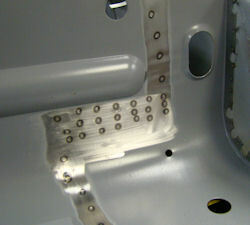 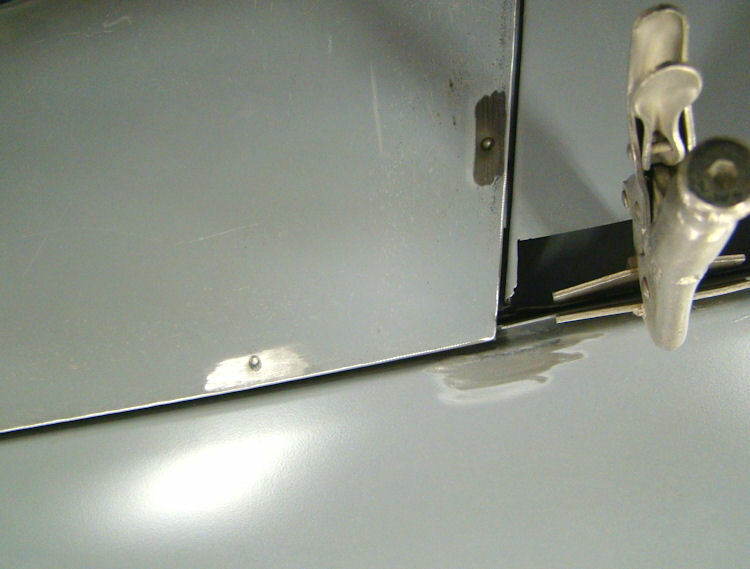 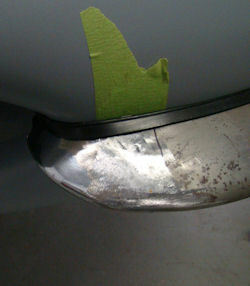 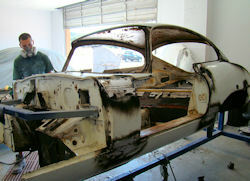 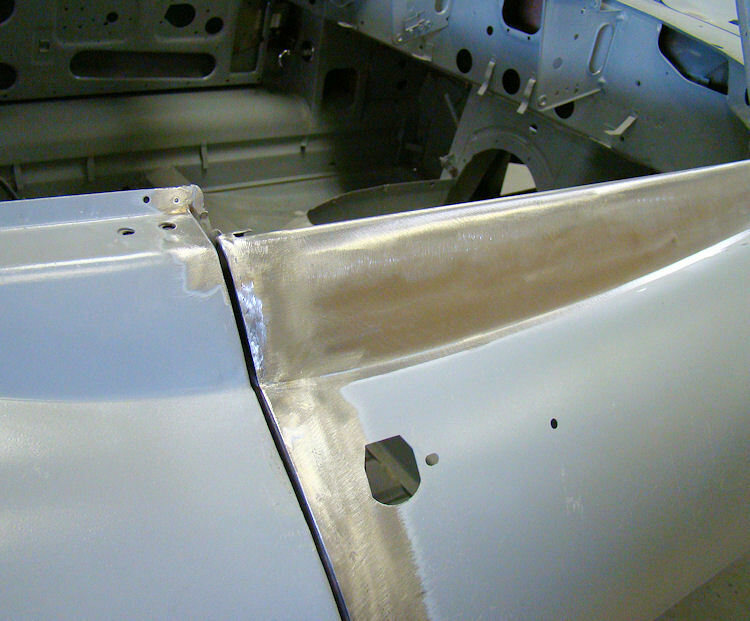 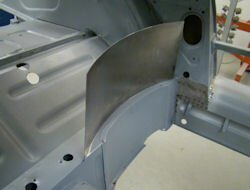 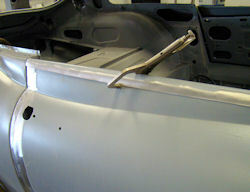 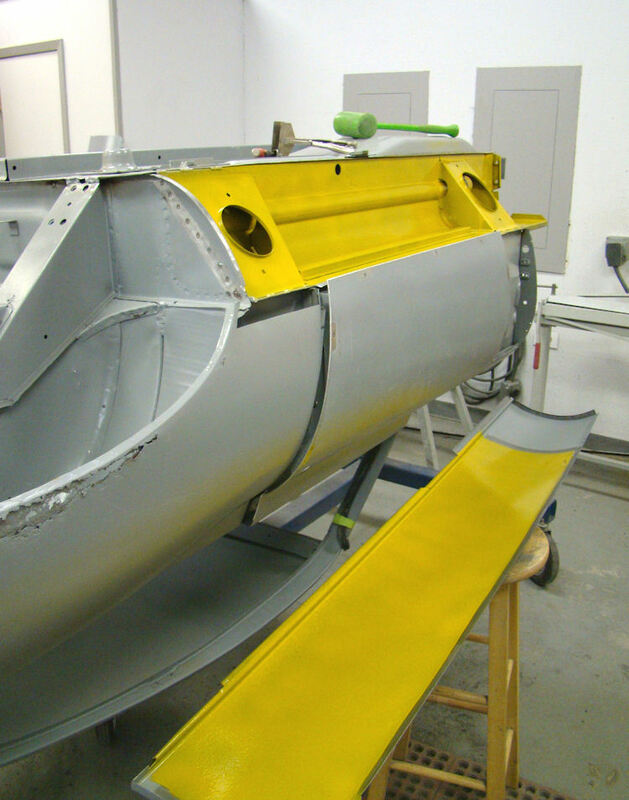 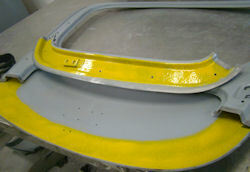 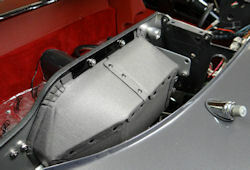 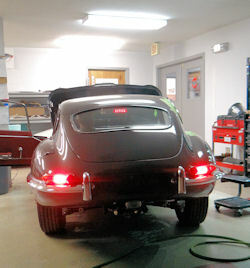 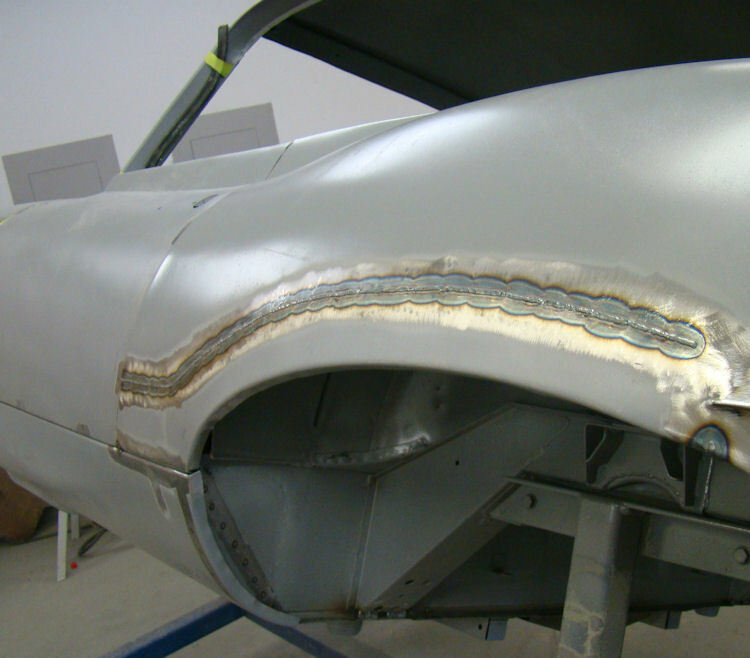 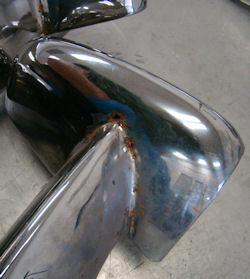 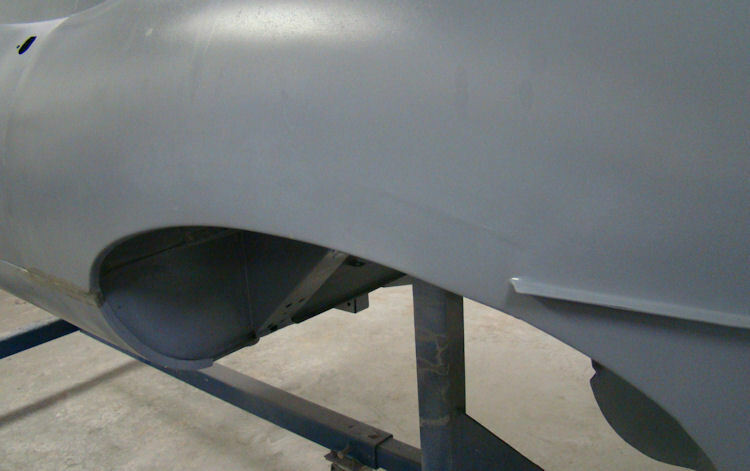 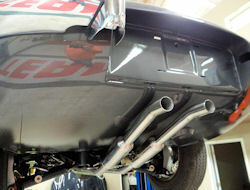 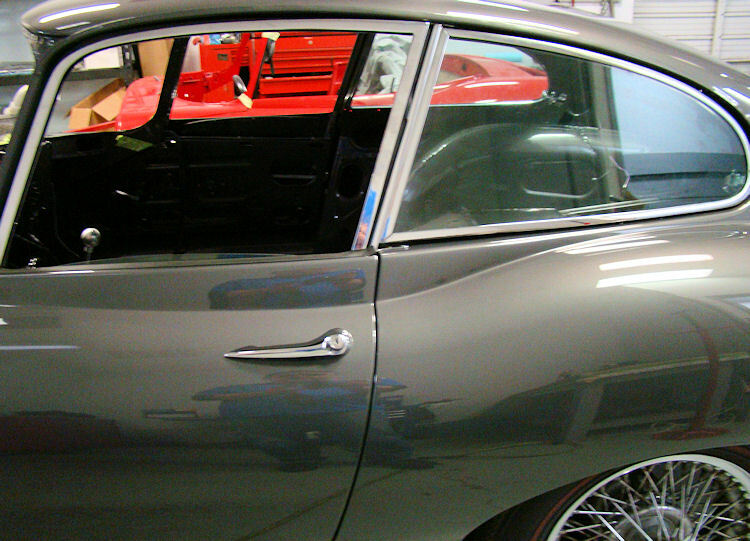 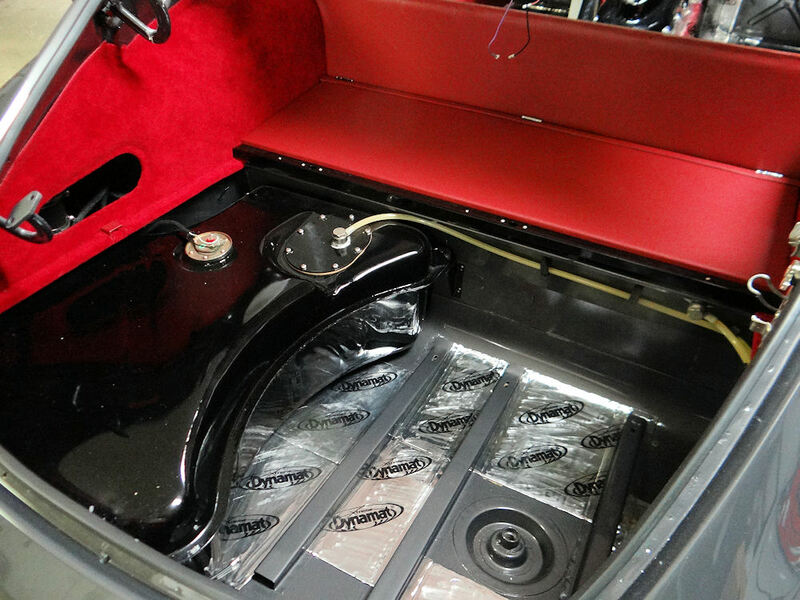 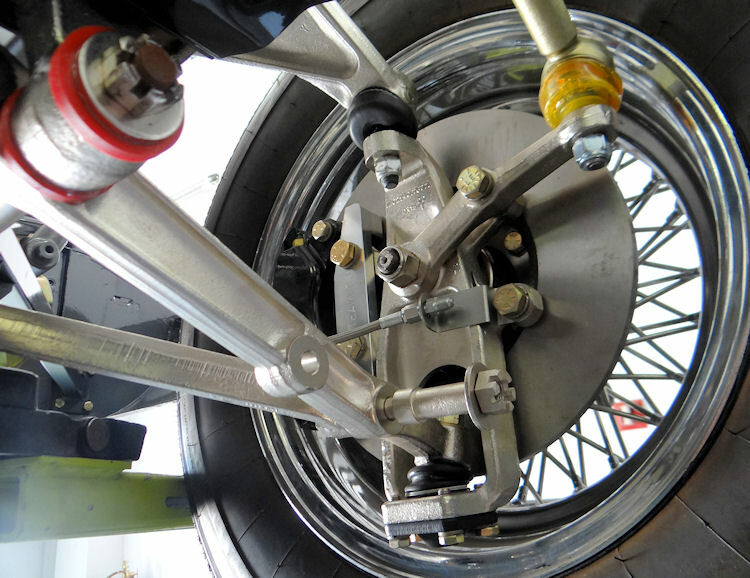 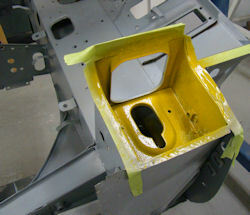 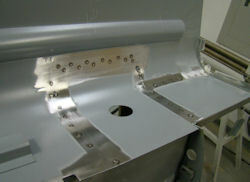 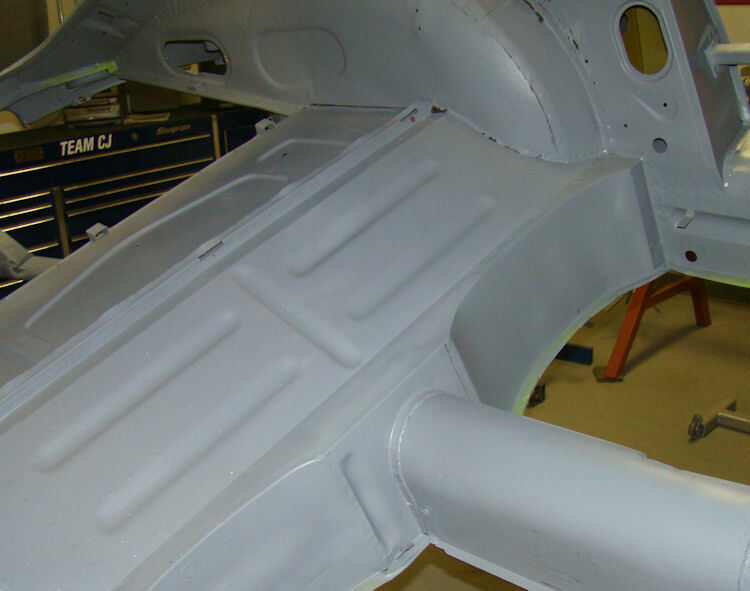 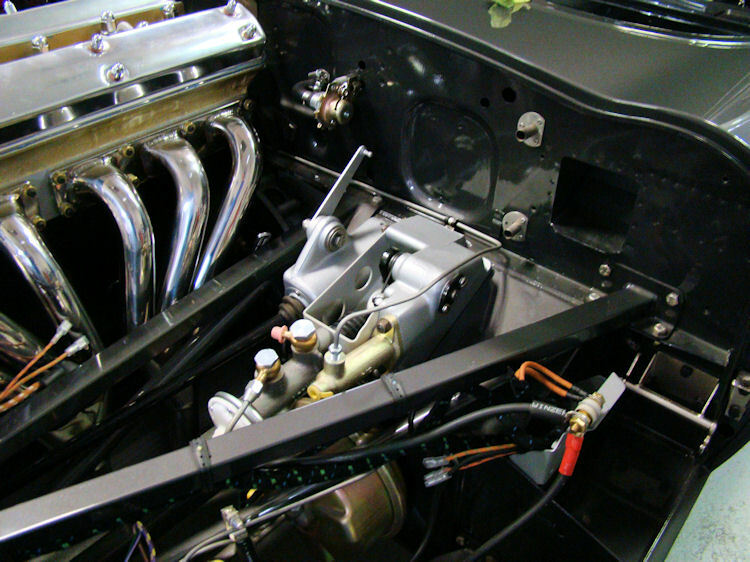 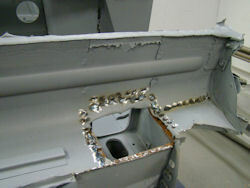 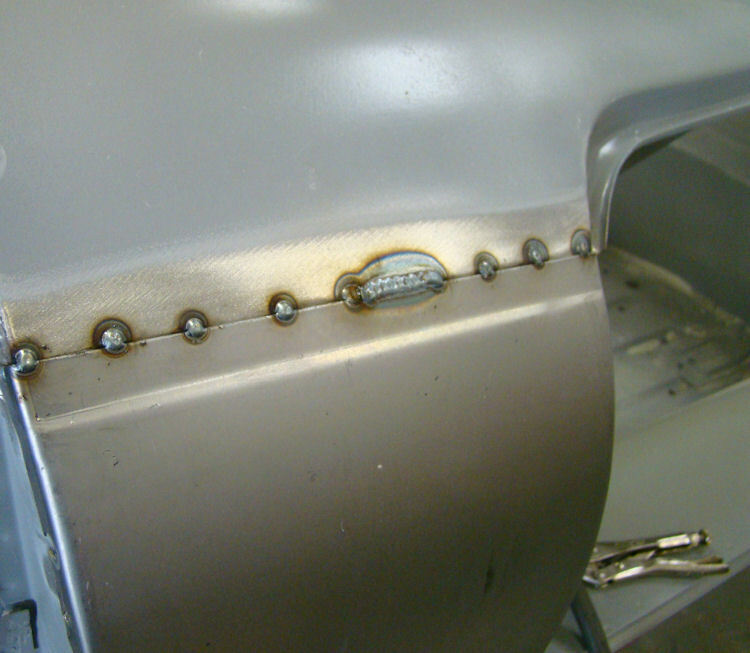 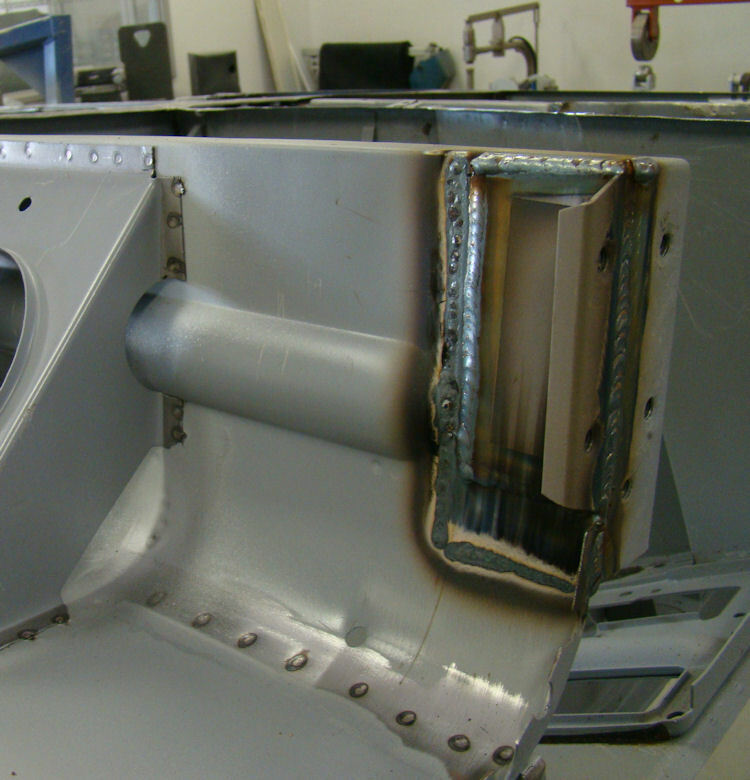 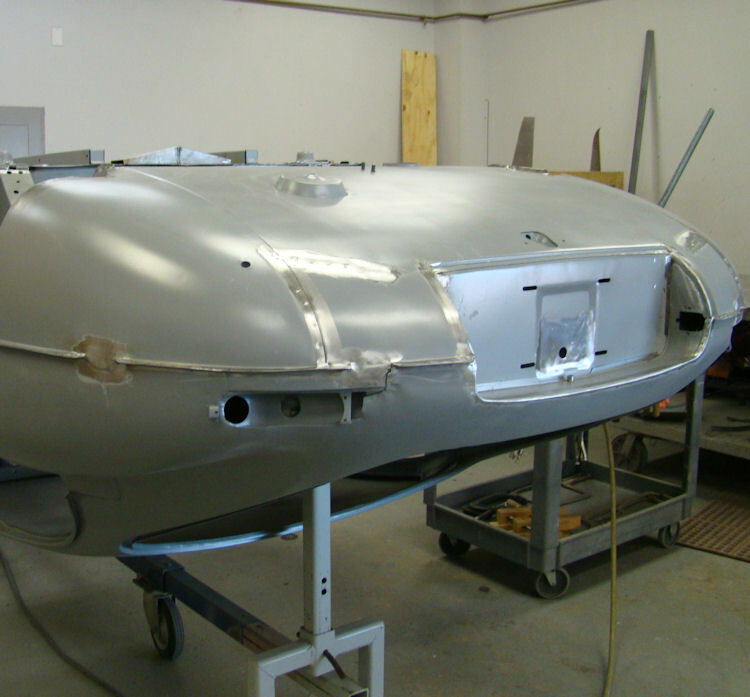 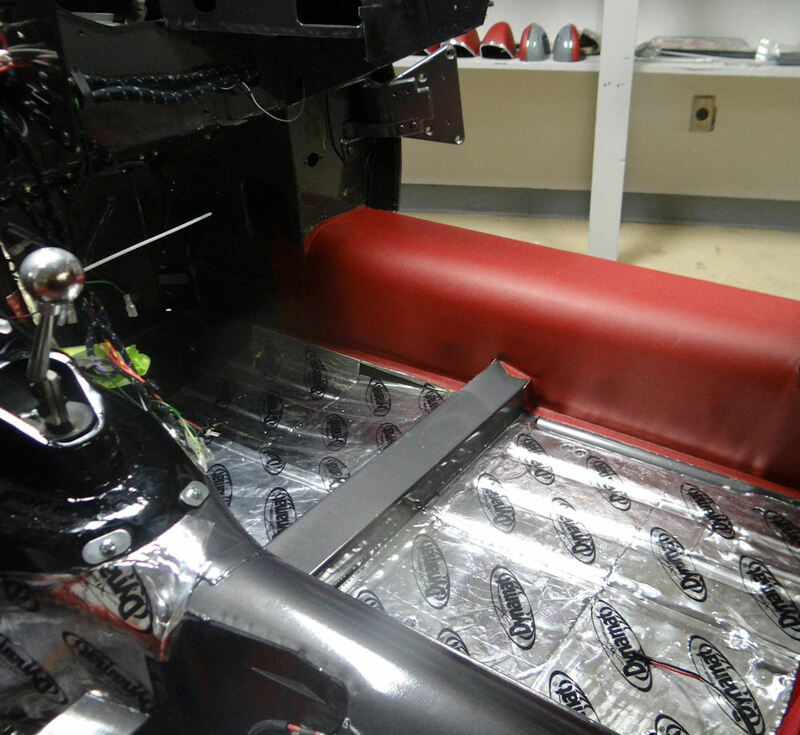 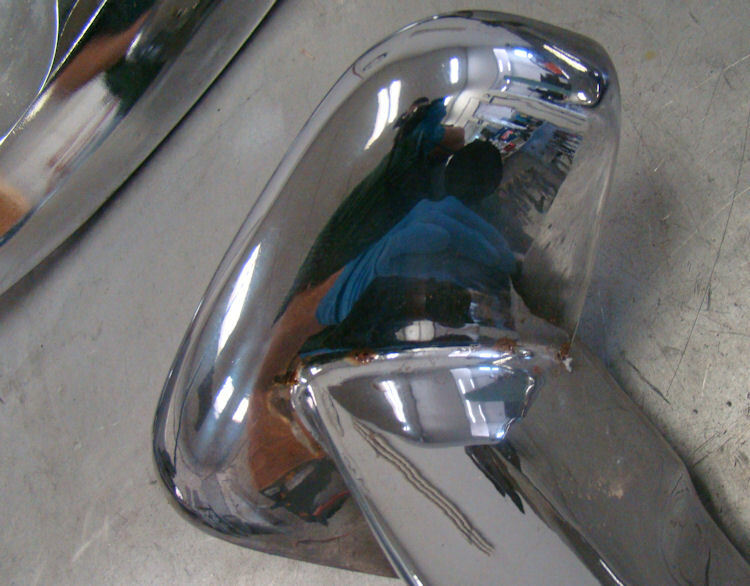 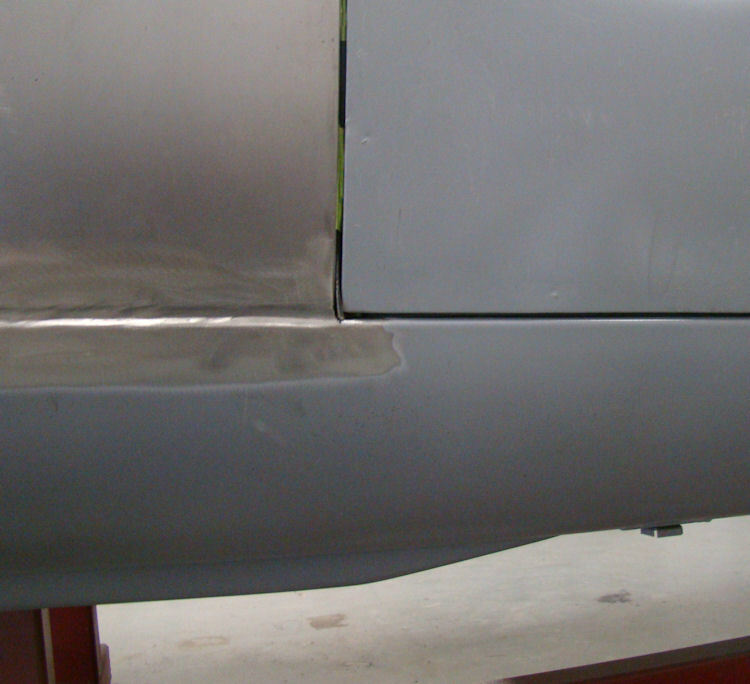 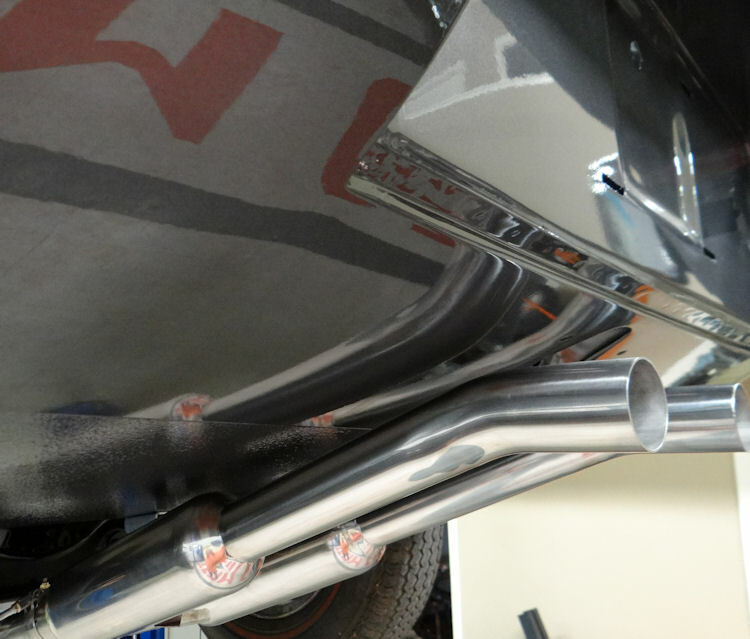 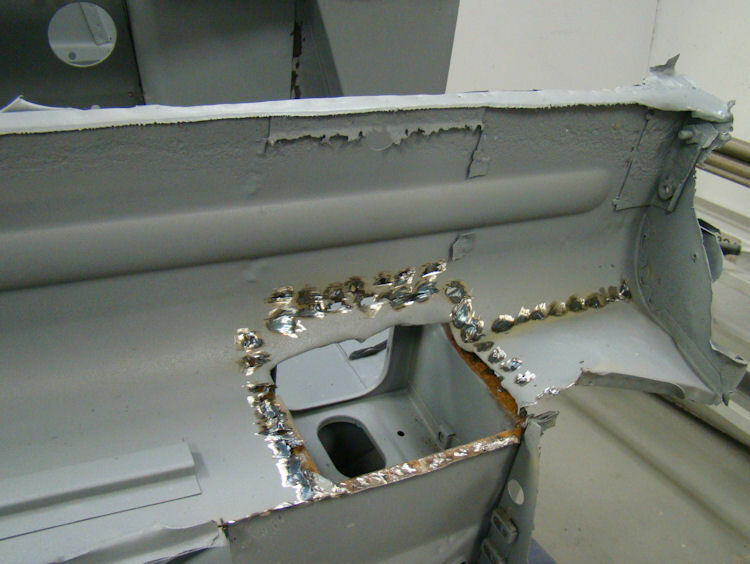 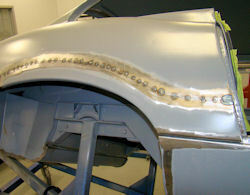 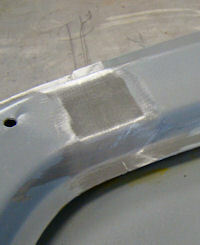 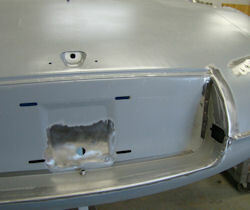 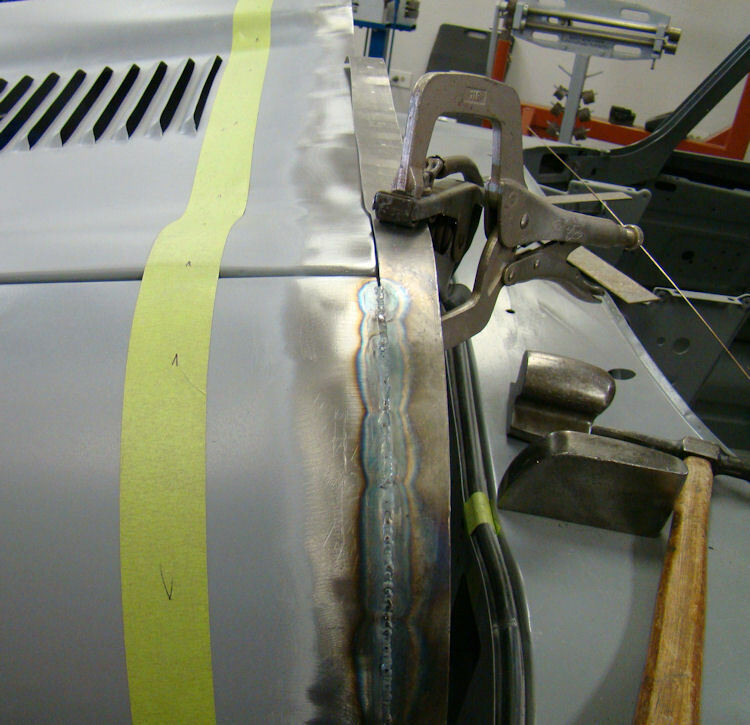 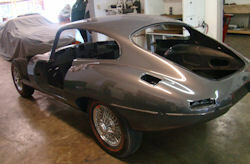 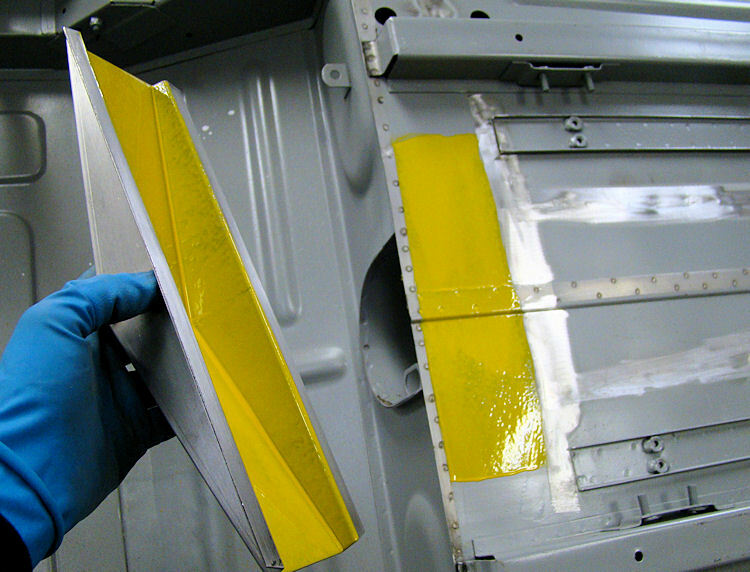 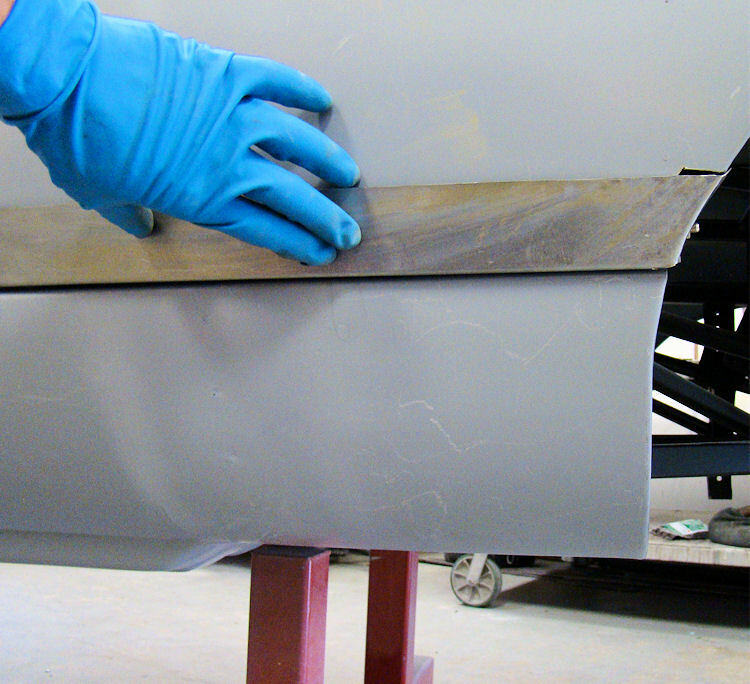 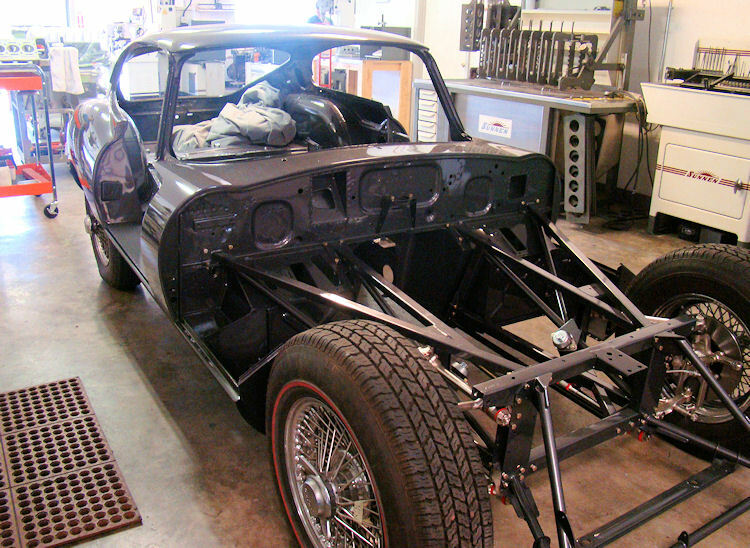 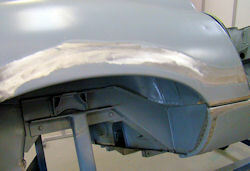 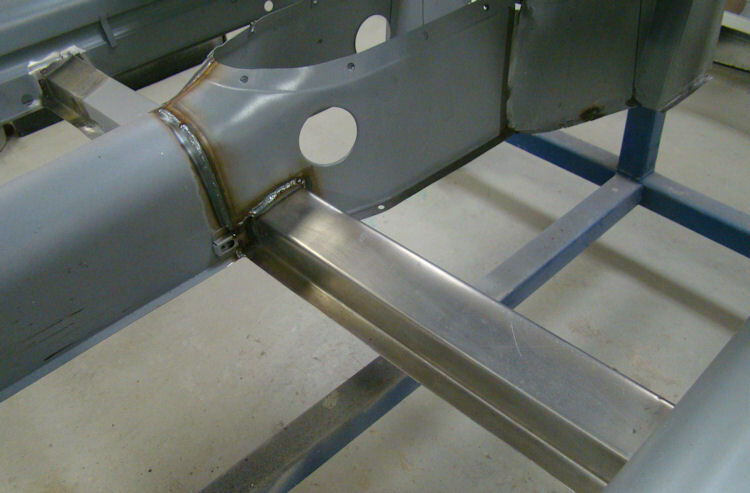 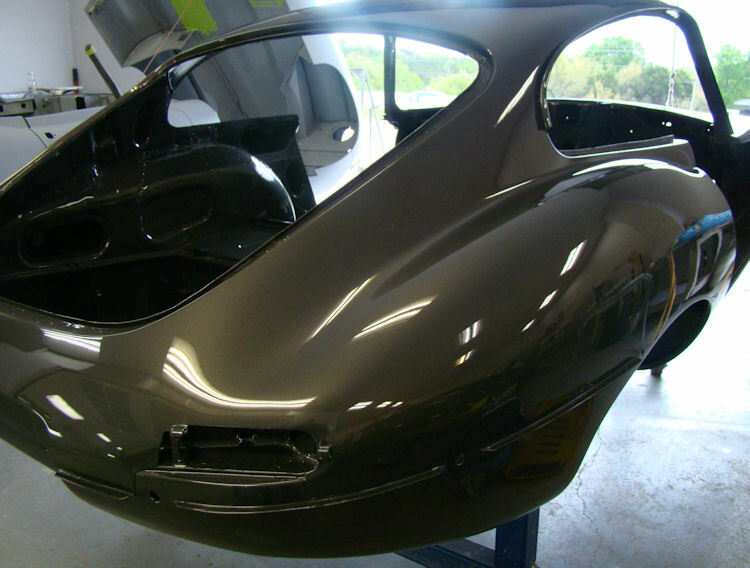 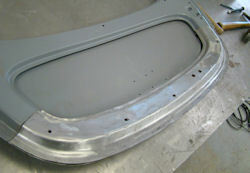 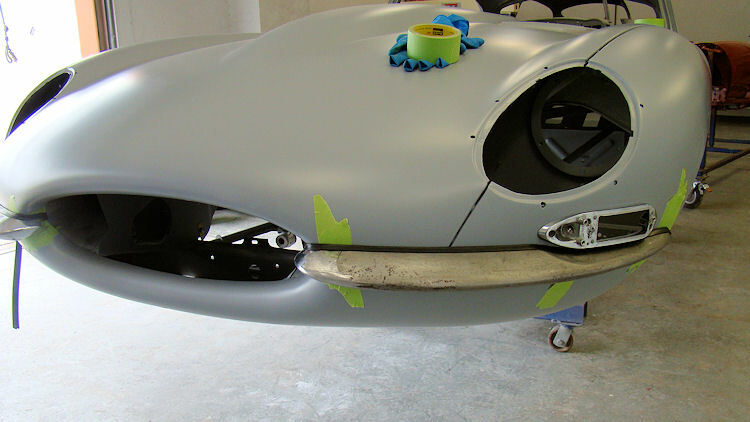 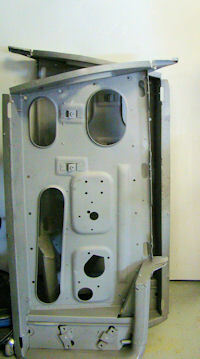 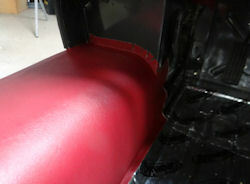 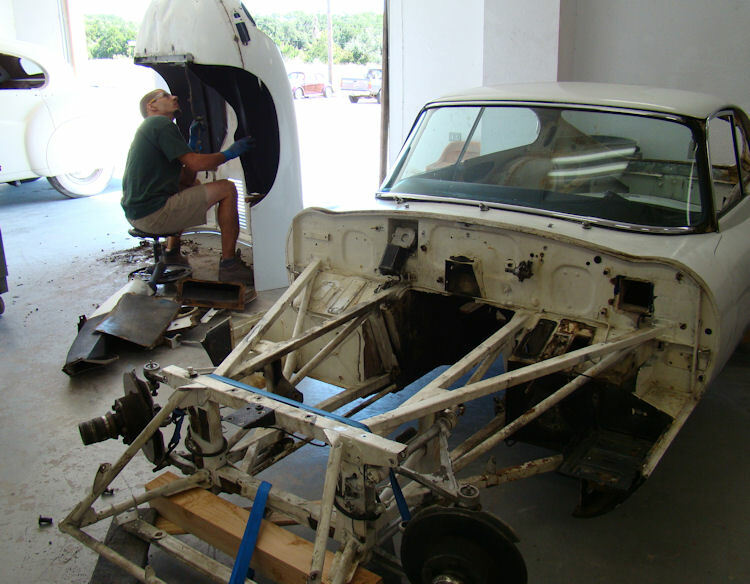 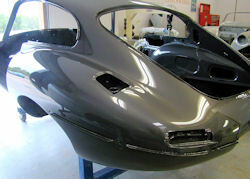 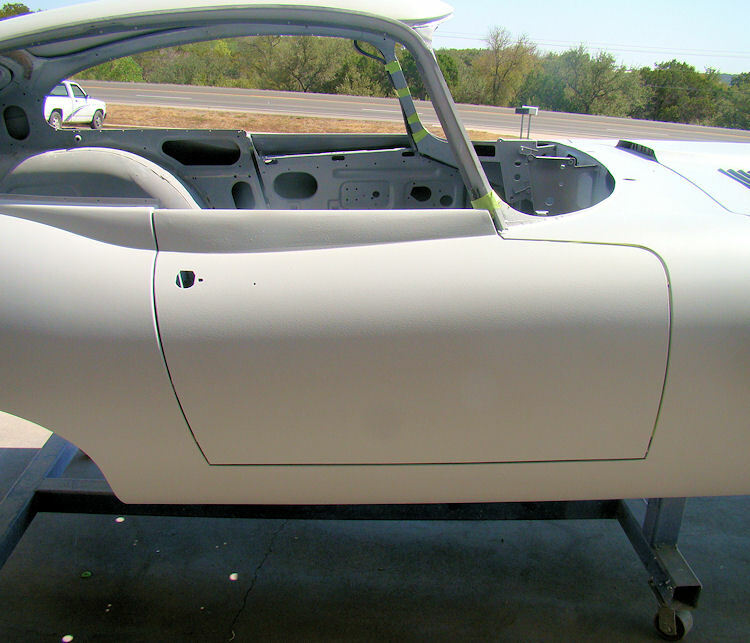 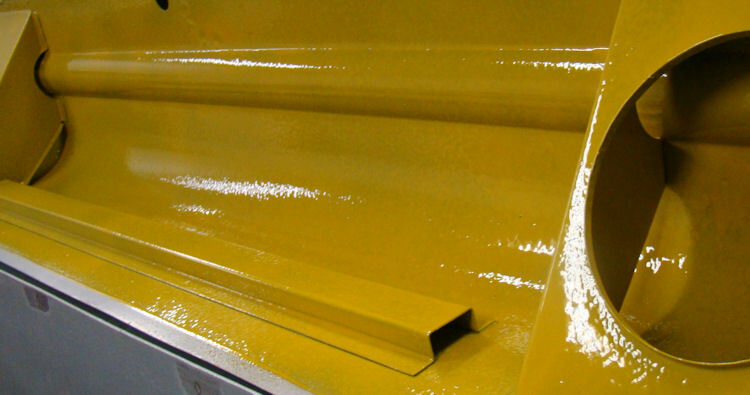 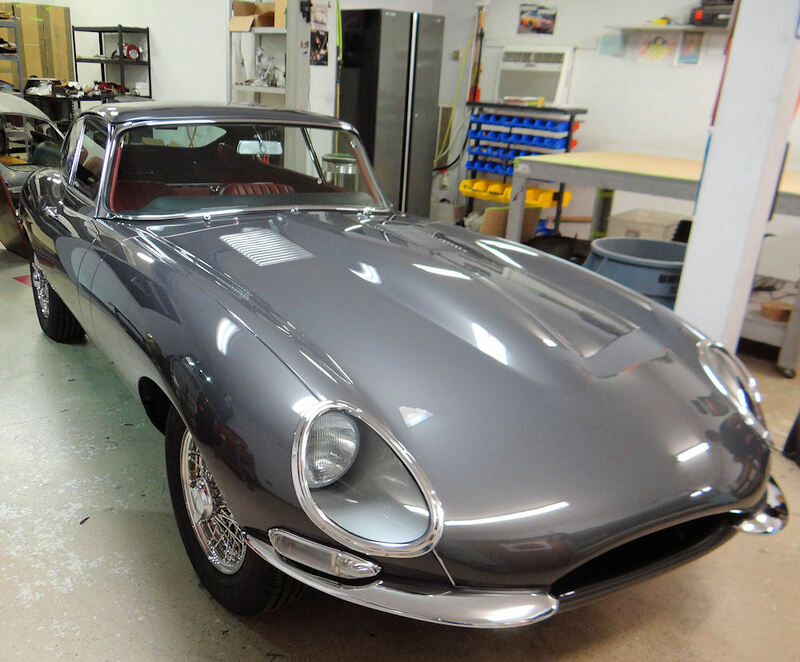 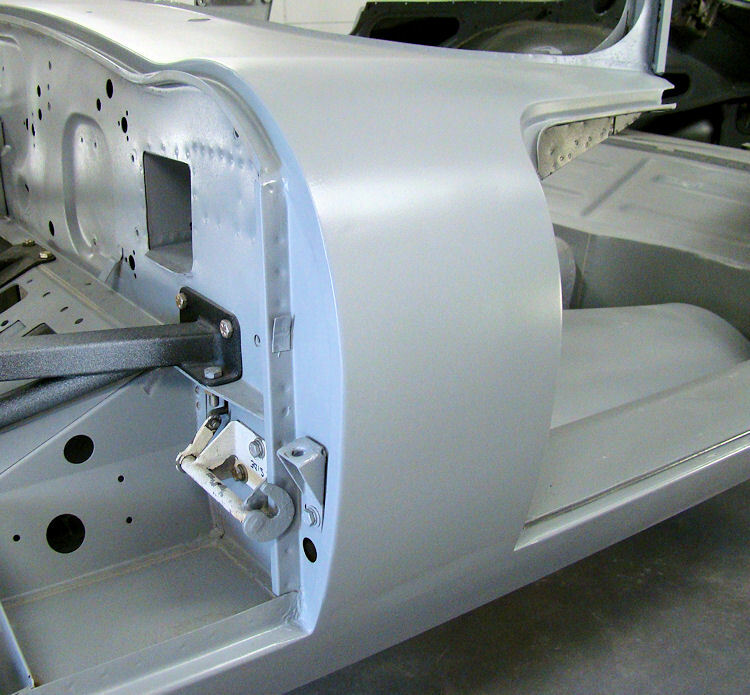 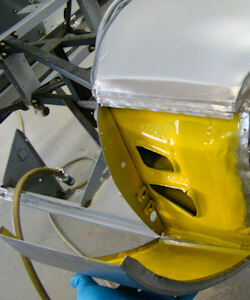 With your car now in high build Glasurit primer, it is time to trial fit the chrome. 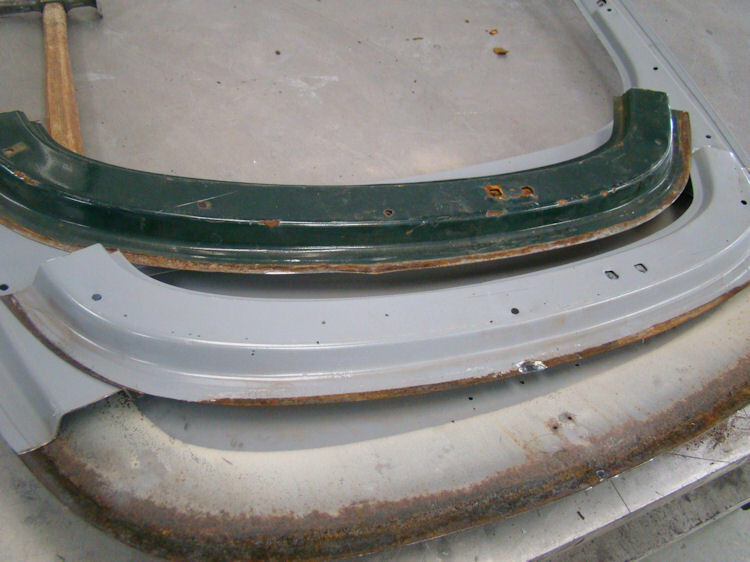 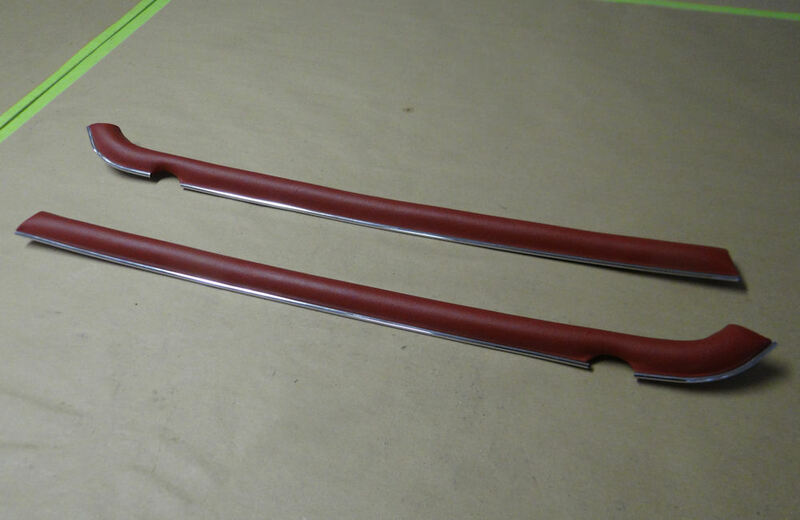 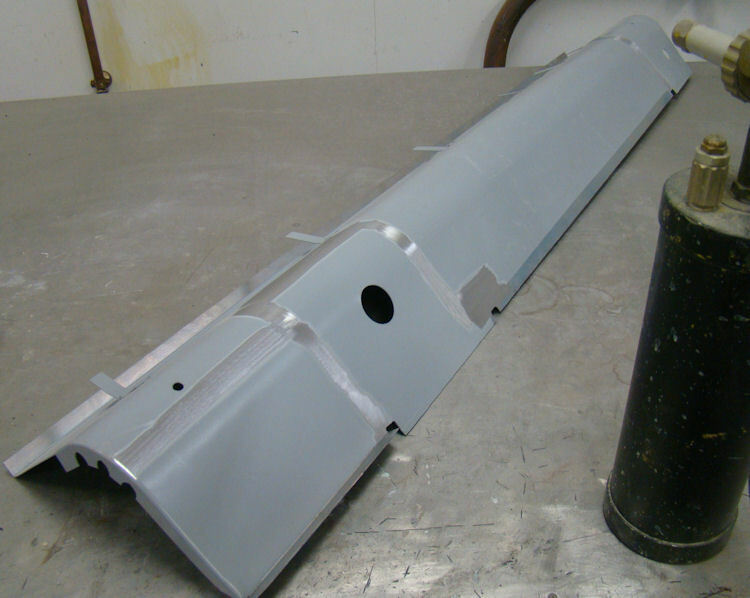 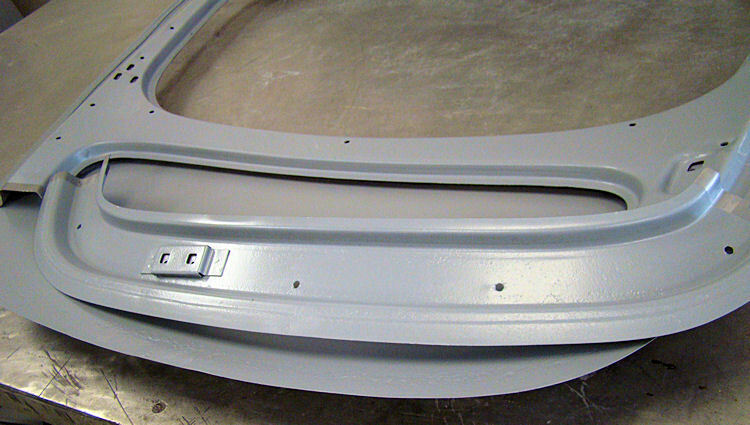 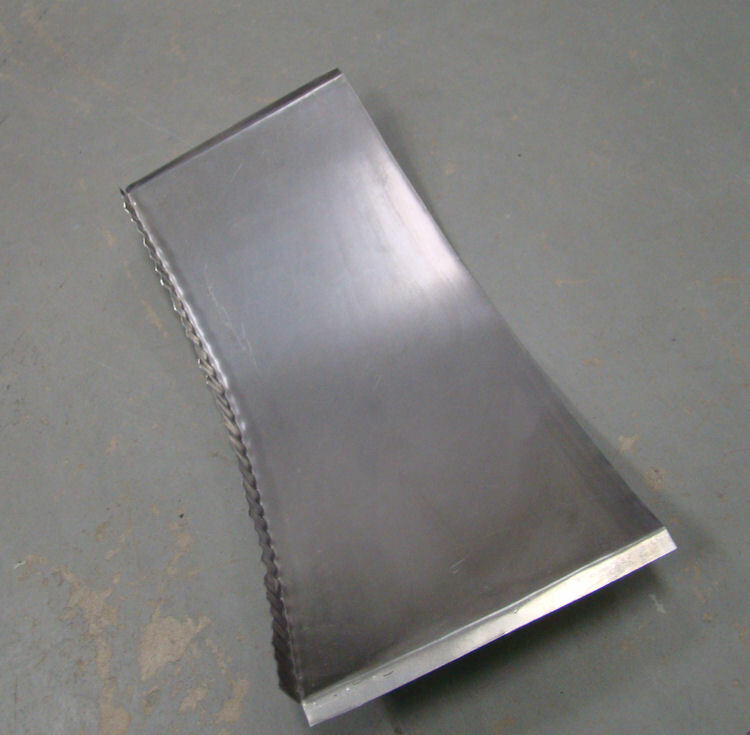 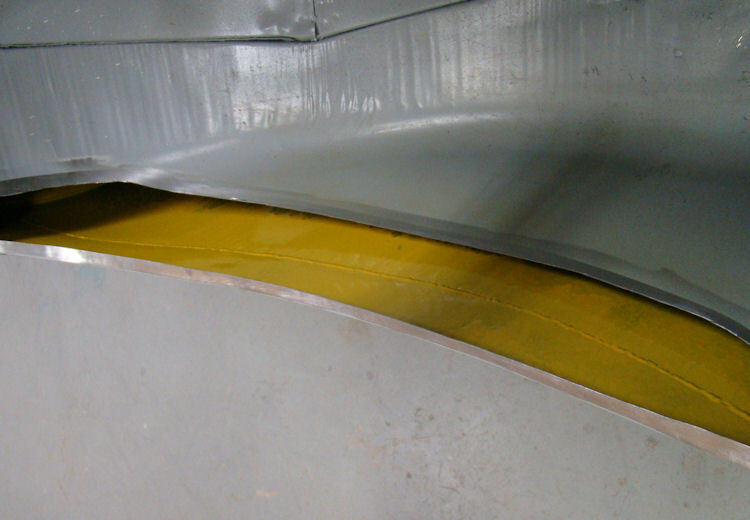 Per your instructions, we have welded the front bumper blade finishers to the main bumper blades and eliminating the front bumper overriders and the bonnet mouth badge bar altogether. 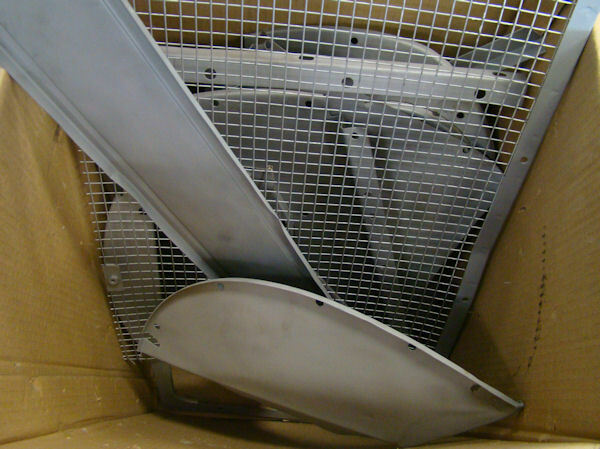 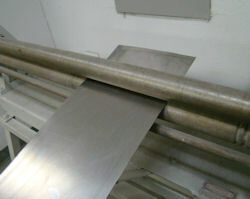 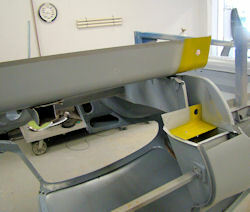 We hope to be applying the first of the Opalescent Gunmetal next week. 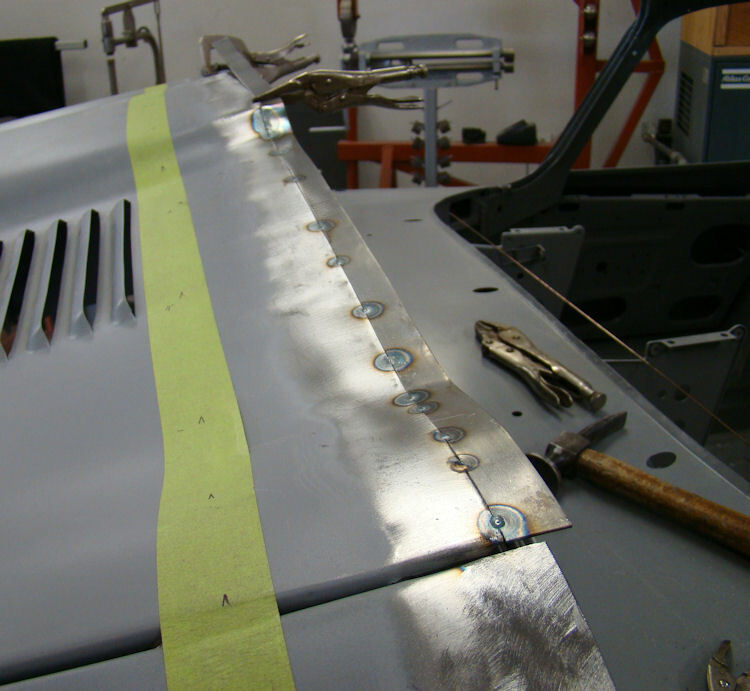 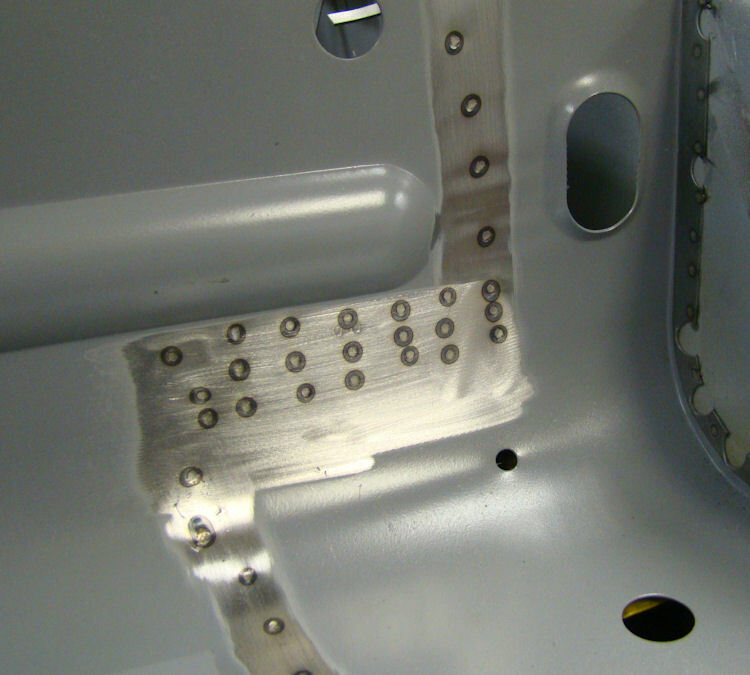 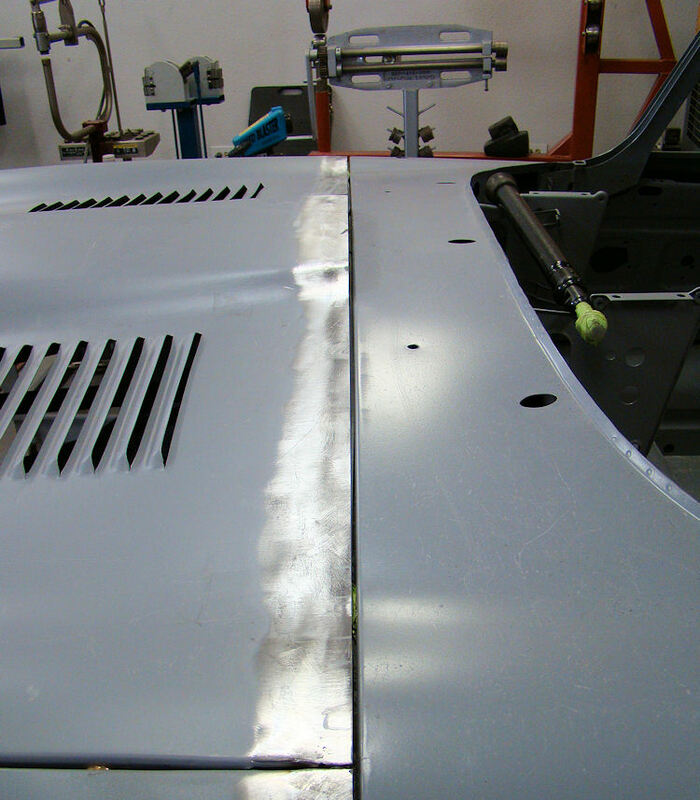 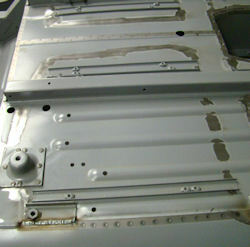 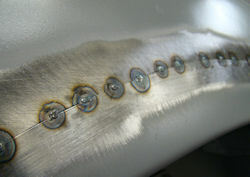 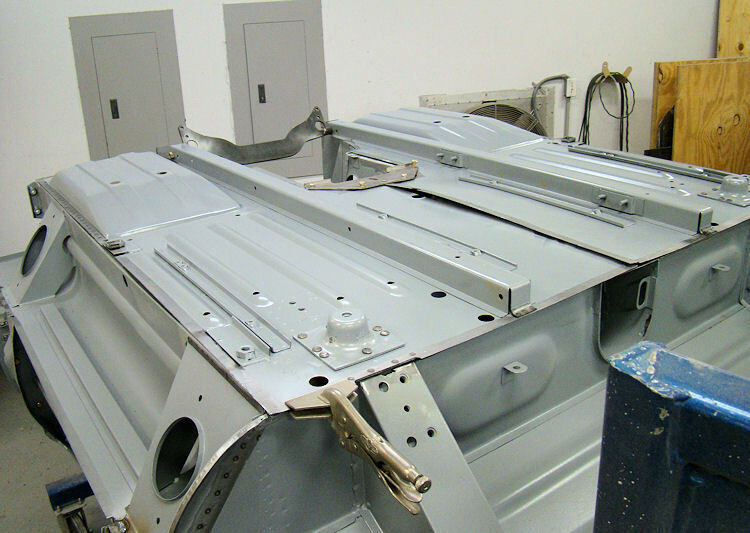 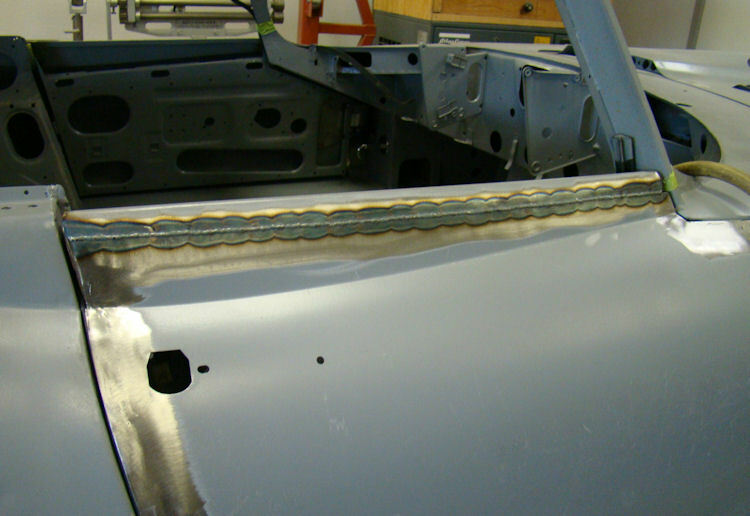 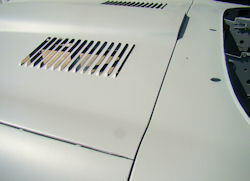 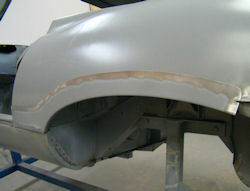 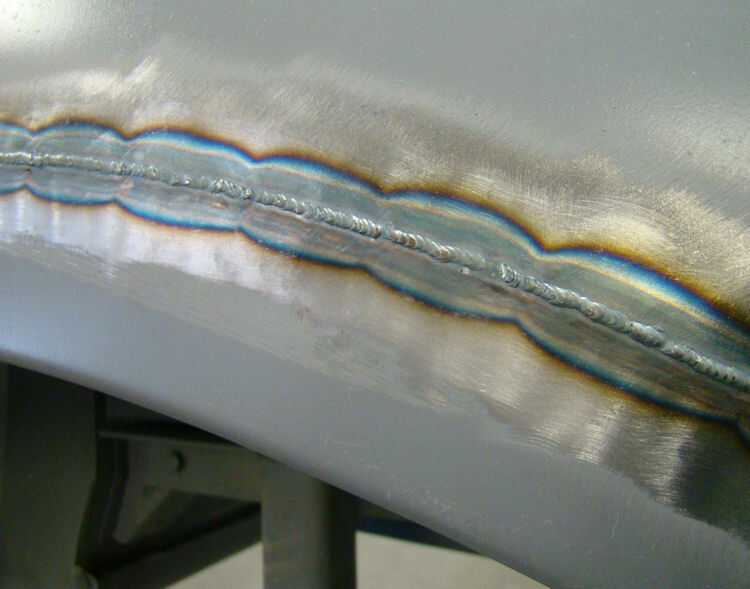 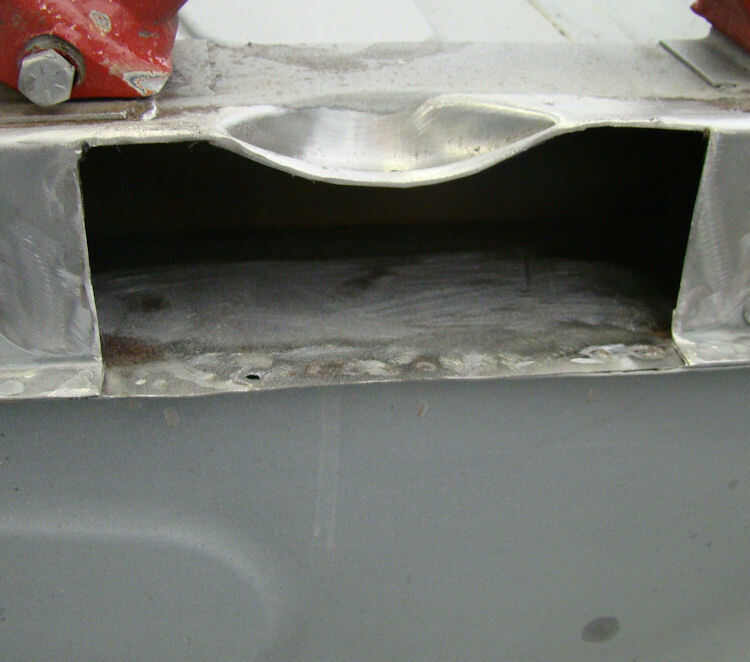 I am pleased to report that we have now completed the sheet metal repairs and your car is now ready for the filler and blocking stage. 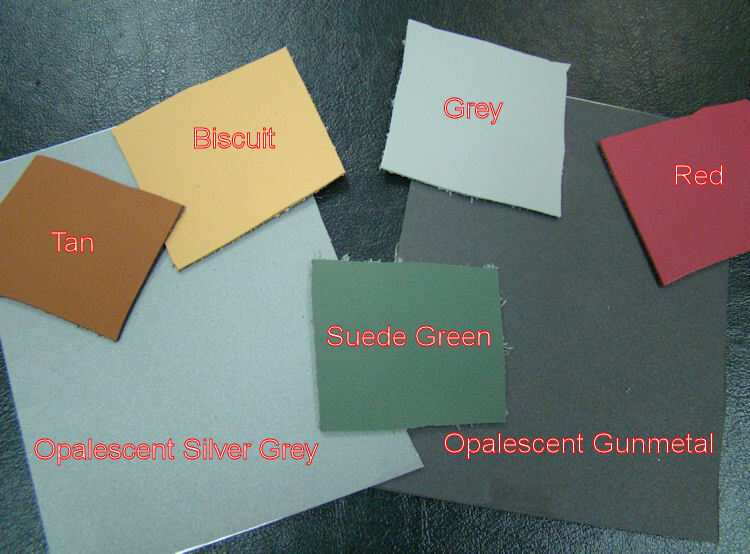 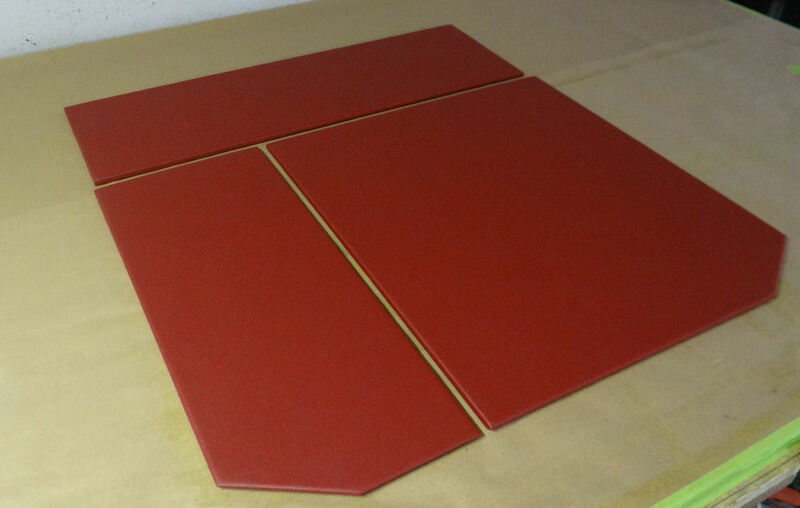 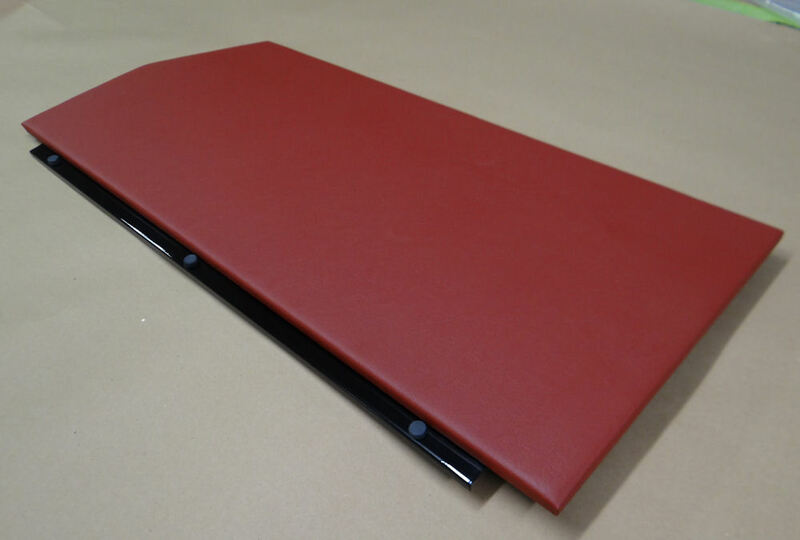 The paint and leather samples below are winging their way to California for your consideration. 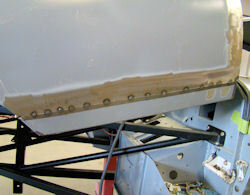 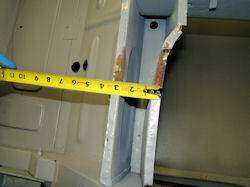 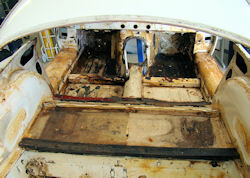 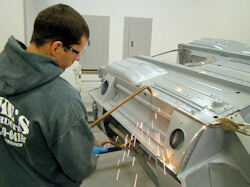 The following sequence of photos show Darrell carrying out some rust repairs on the tailgate. 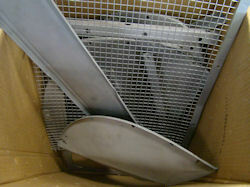 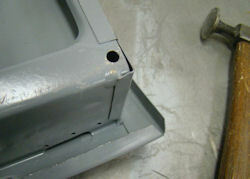 We actually used a rust free section from an alternative (used) tailgate. 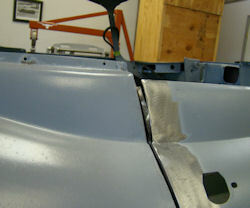 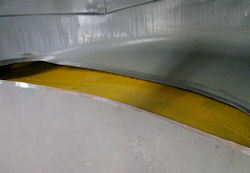 Overriders welded to bumper blades ! 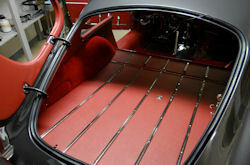 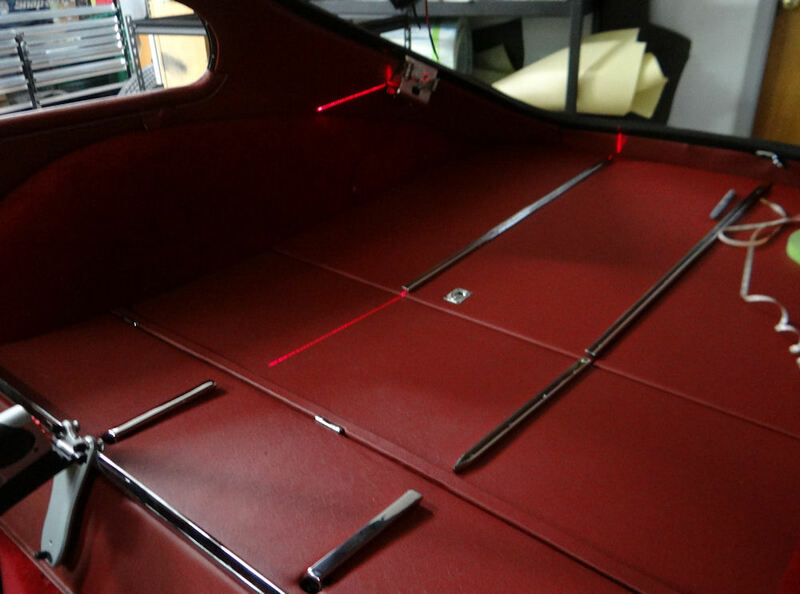 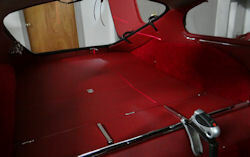 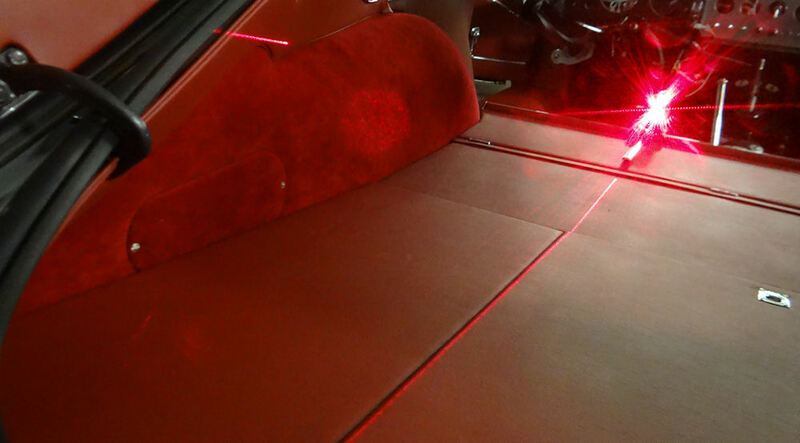 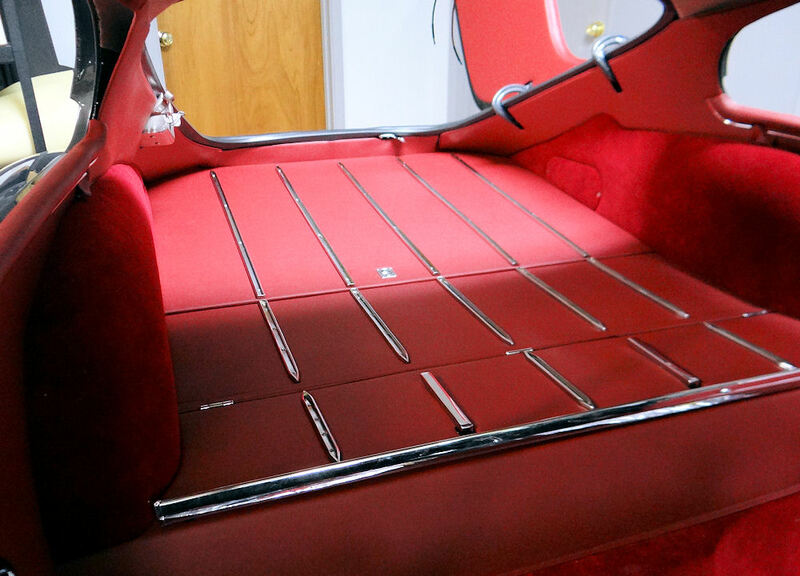 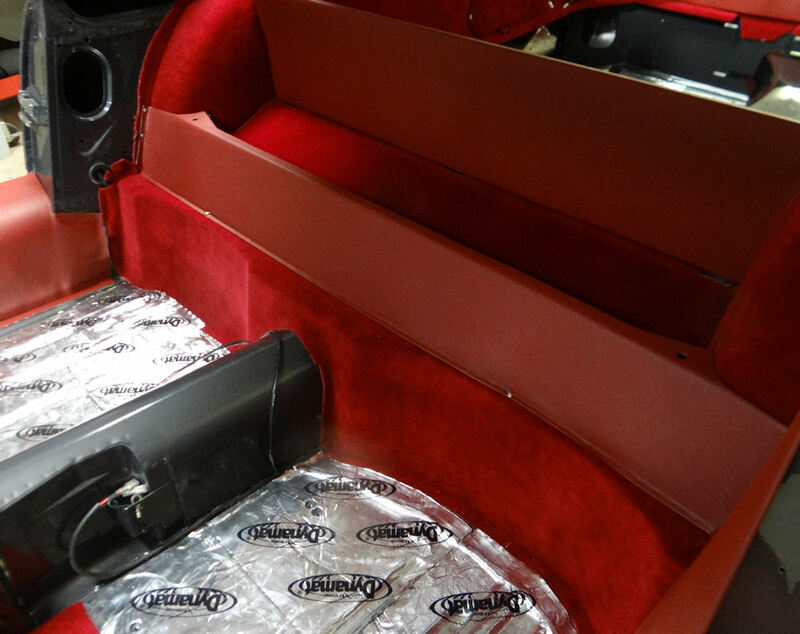 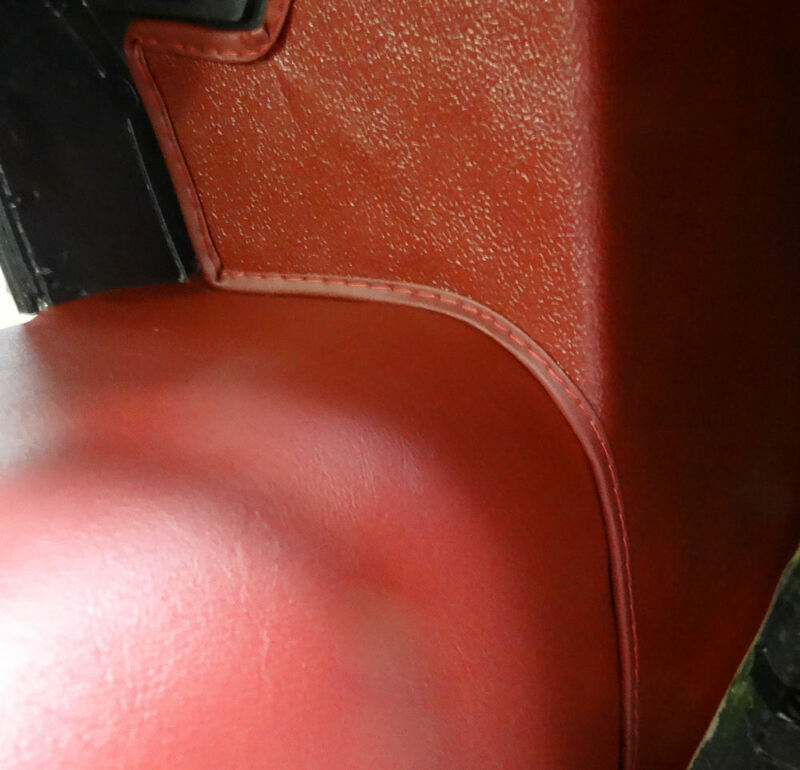 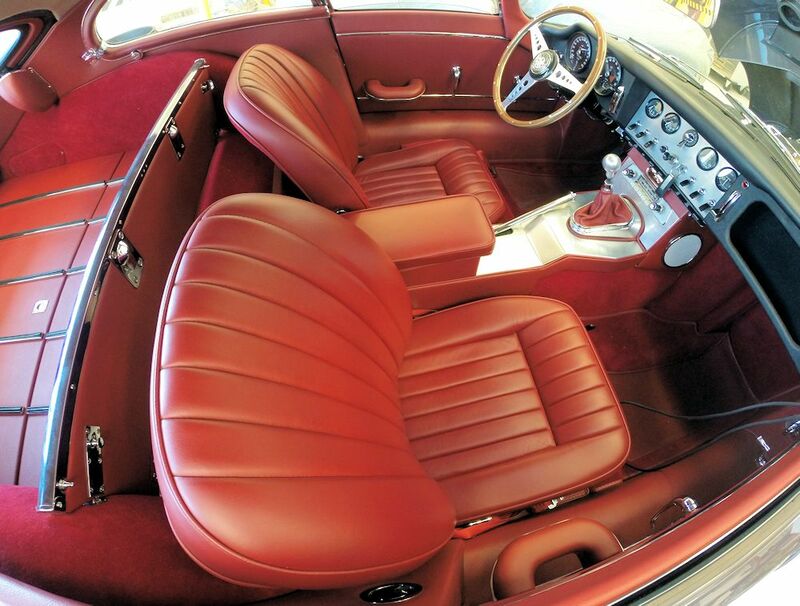 While dealing with some rust in the vertical rear bulkheads behind the seats, we took the opportunity to provide the car owner with a couple of extra inches of leg room. 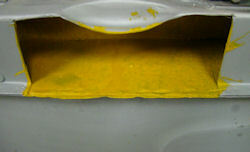 Back from the blaster, there really aren't any nasty surprises. 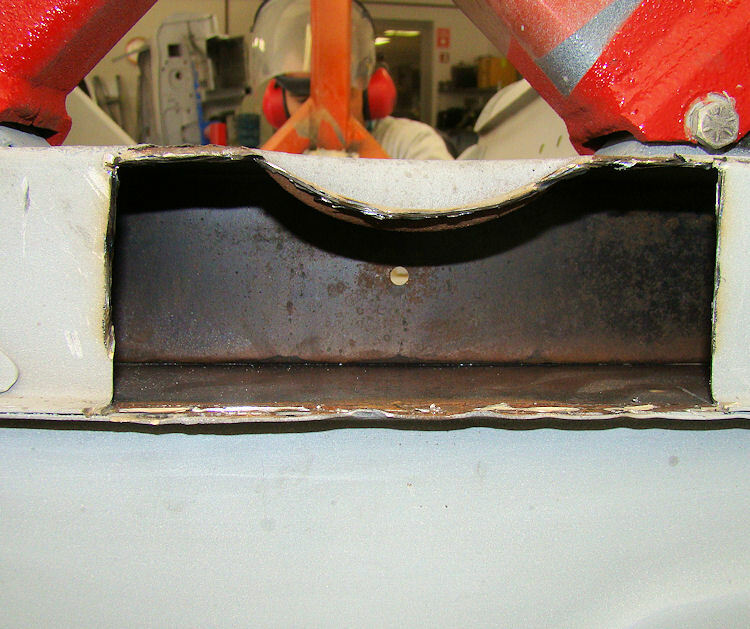 The bonnet is definitely serviceable, which is great news. 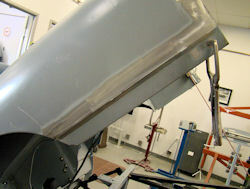 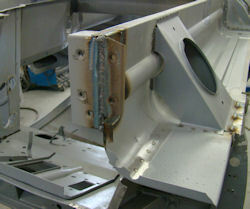 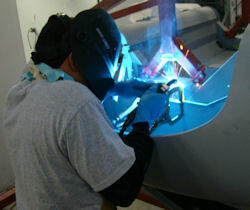 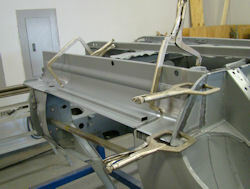 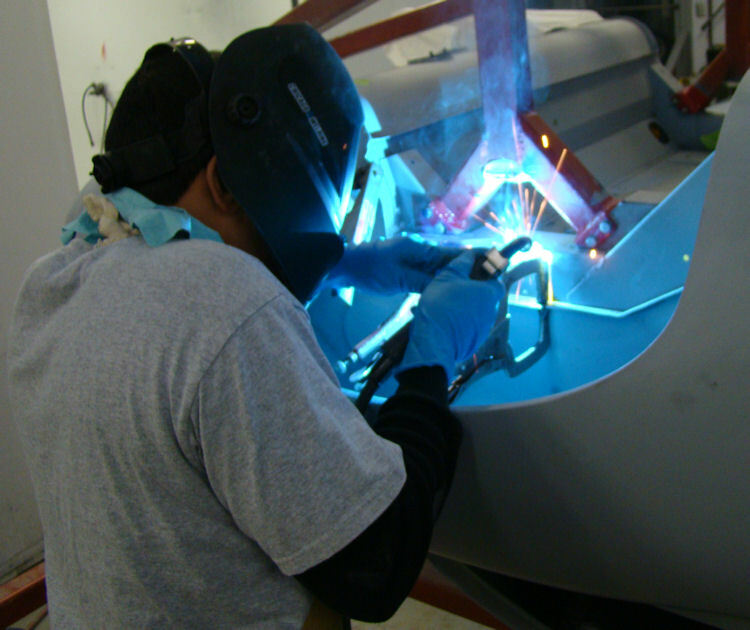 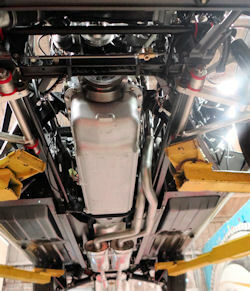 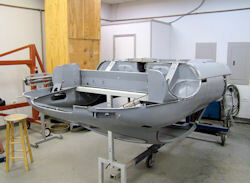 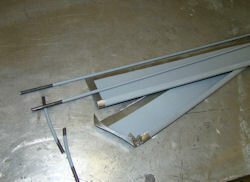 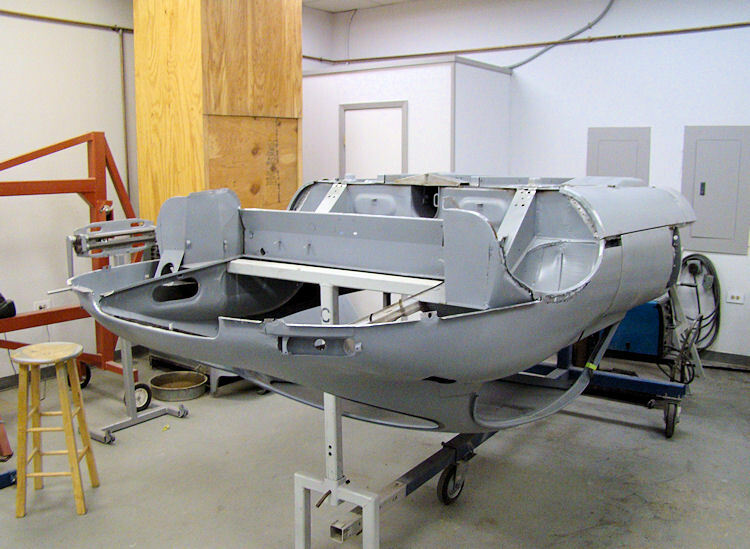 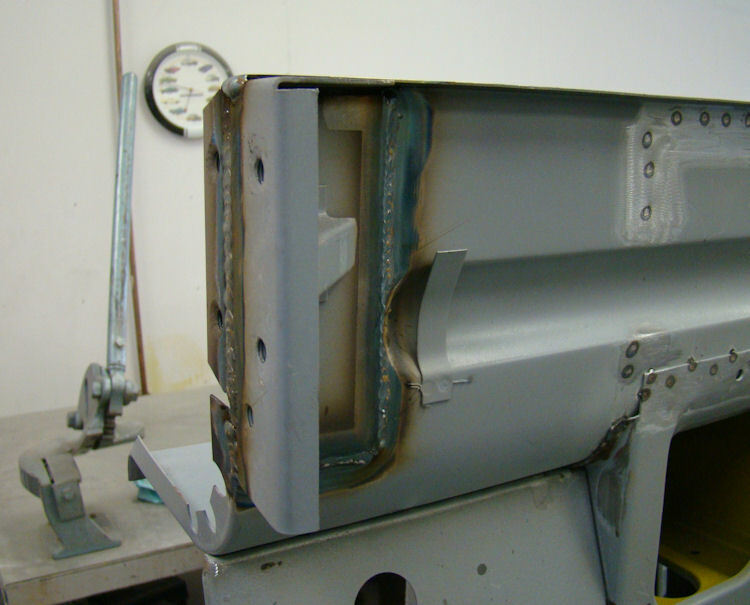 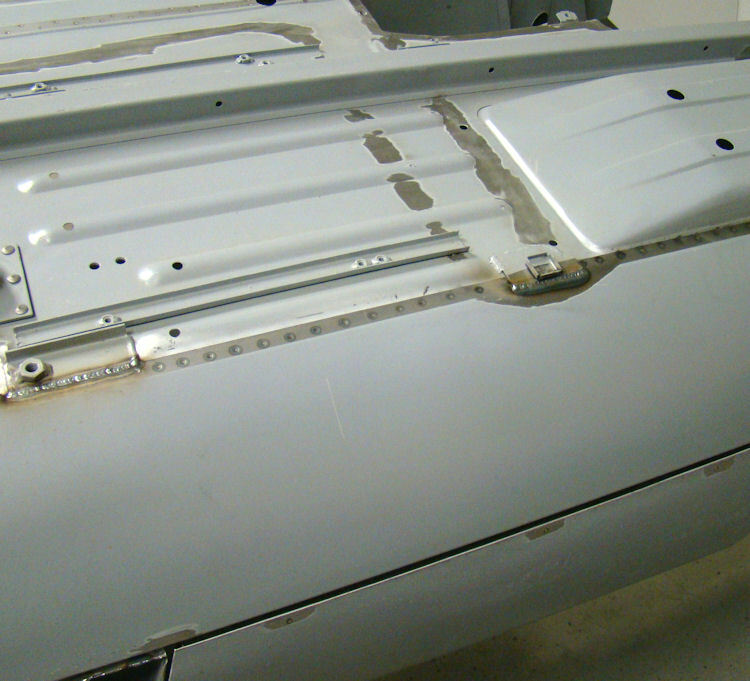 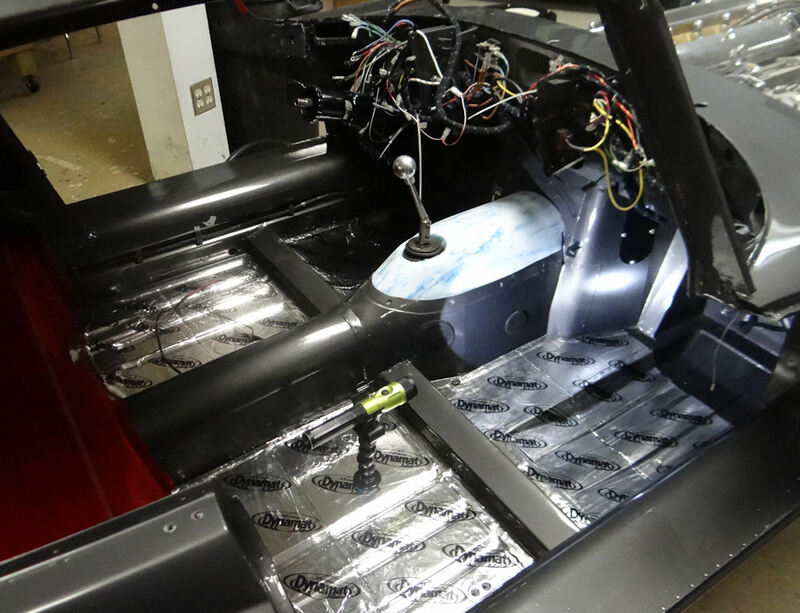 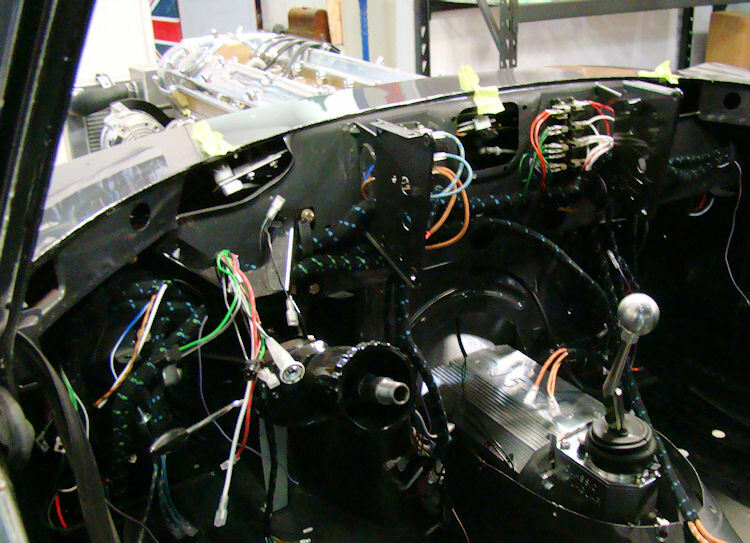 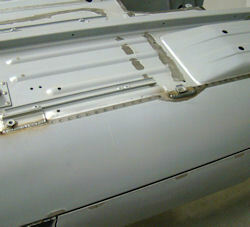 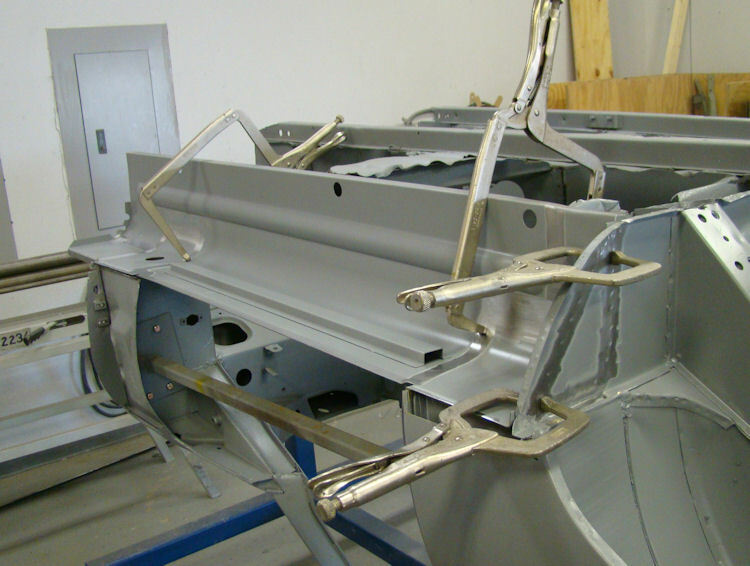 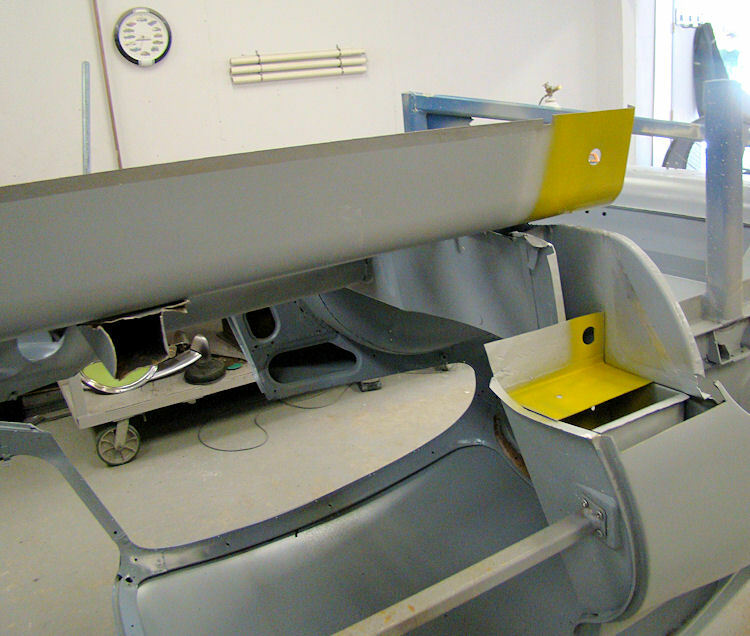 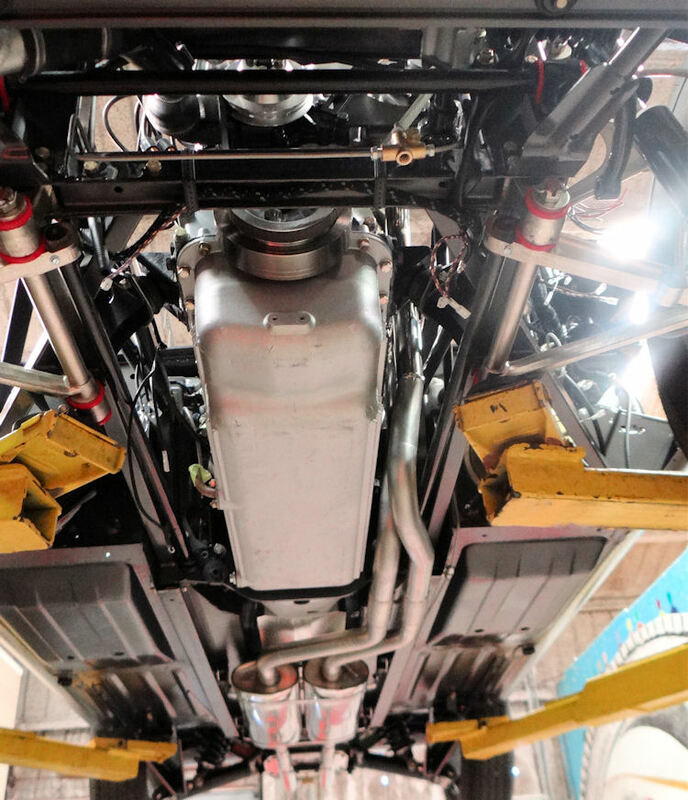 We now have your car completely disassembled with the main monocoque on one of the rotisserie jigs. 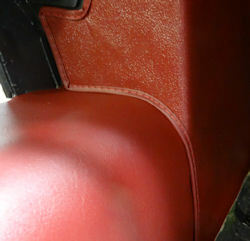 Off to the blaster tomorrow! 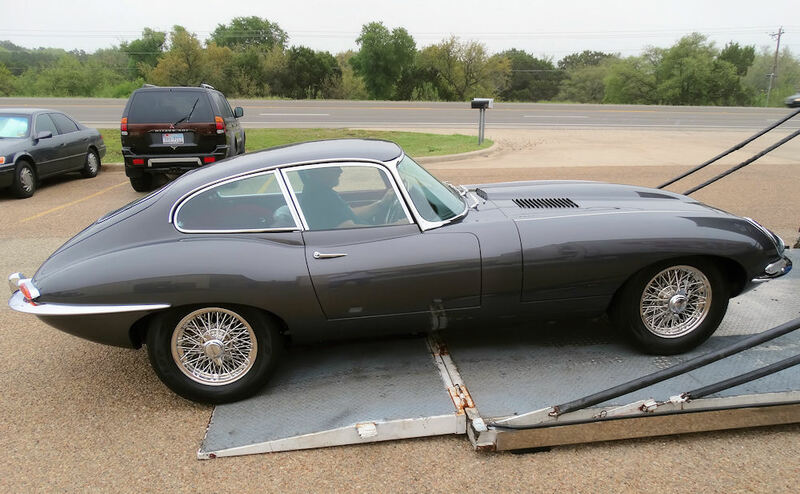 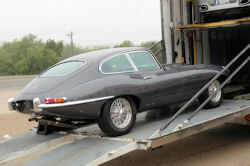 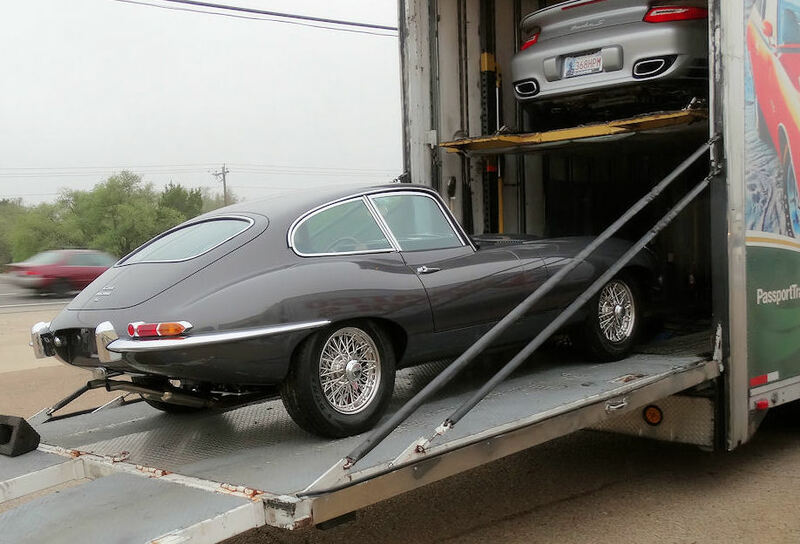 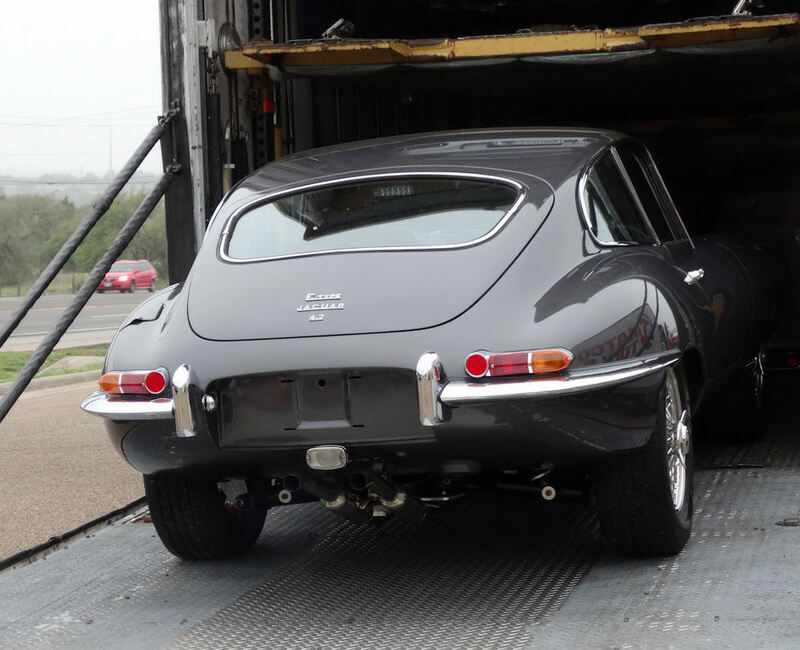 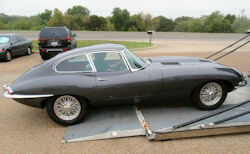 I am delighted to report that your car has arrived safely in Austin and we will have the restoration underway in the next few days!